Thanksgiving is one of my favorite American holidays, because — well, that’s easy. It involves cooking! It took me a long time to warm to the taste of turkey. But having married into an American family that loves their annual turkey dinner, I didn’t really have a choice. It was a love-it-or-leave-it type of deal…well, maybe never quite that harsh. But I was certainly scared straight. 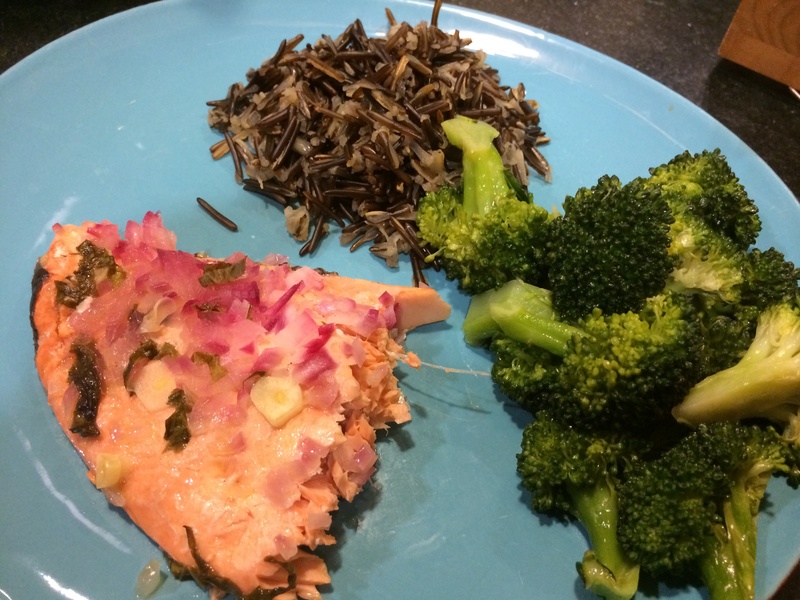 I began to not only enjoy that once bland, inscrutable meat, but also crave it. And on the years that we are away from family (like this one), my husband demands a ‘proper’ American turkey meal. 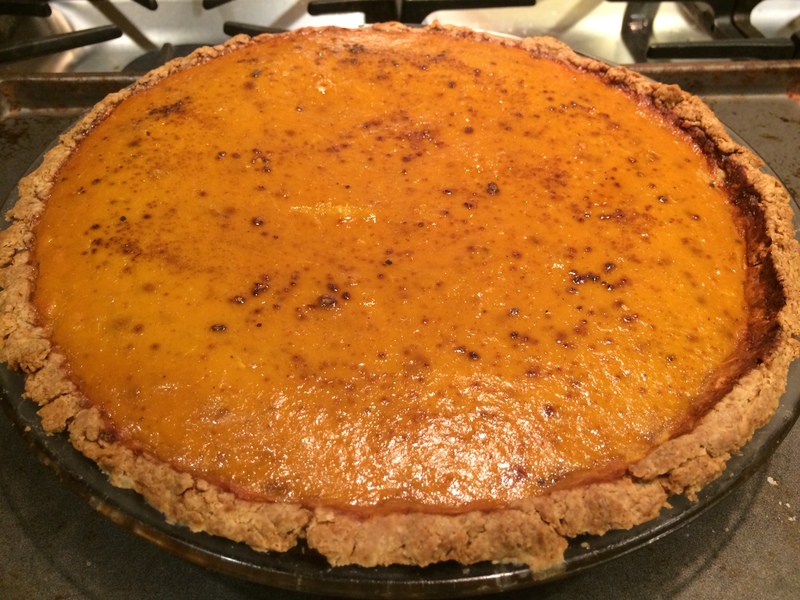 In other words, no garam masala in the pumpkin pie, like the White House chef once did¹. No chilies in the cranberry sauce either! I’ve had a lot of learning to do, but now I can pull off a decent-sized turkey meal with each item made from scratch (naturally). Here is my cheat sheet for my future self, and perhaps any other Thanksgiving seekers for 2015 onward. Of course, make-ahead prep is integral to Thanksgiving. Here are the dishes that I made, in order of how early I made them. Cranberries have that lovely earthly grape-peel flavor that they share with wine…so adding wine to my cranberry sauce seemed appropriate. Three cups of cranberries (whole), half as much red wine. 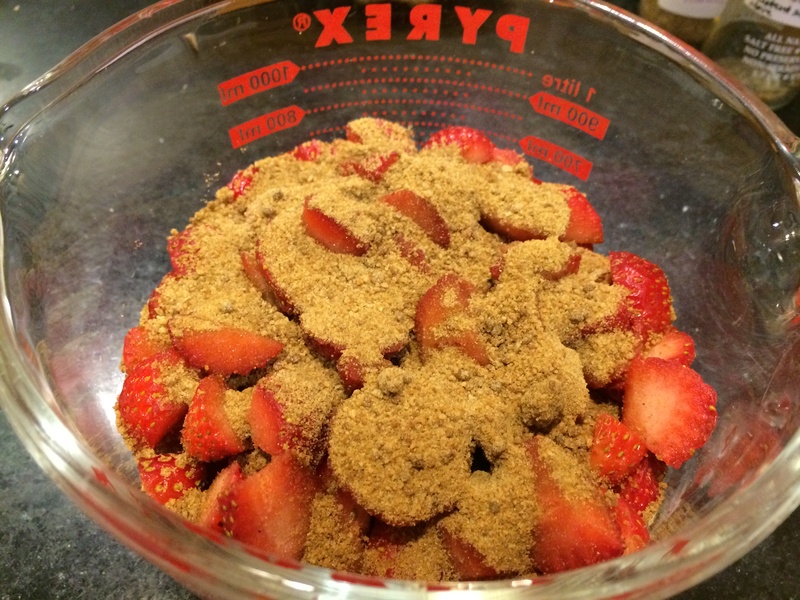 Brown sugar added by the quarter-cup-fulls until I deemed it sweet enough. 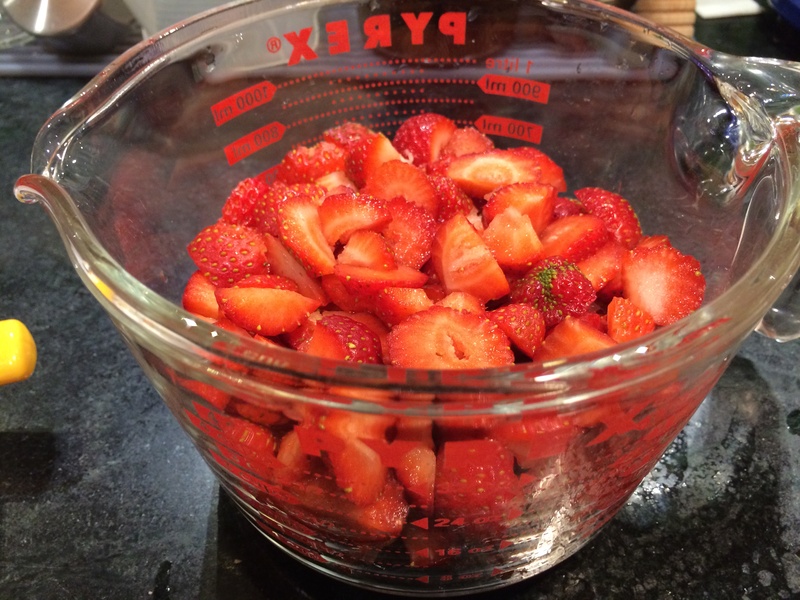 Boil, simmer for a while, popping the berries if they have not popped already. Turn off, cool, and that’s done. 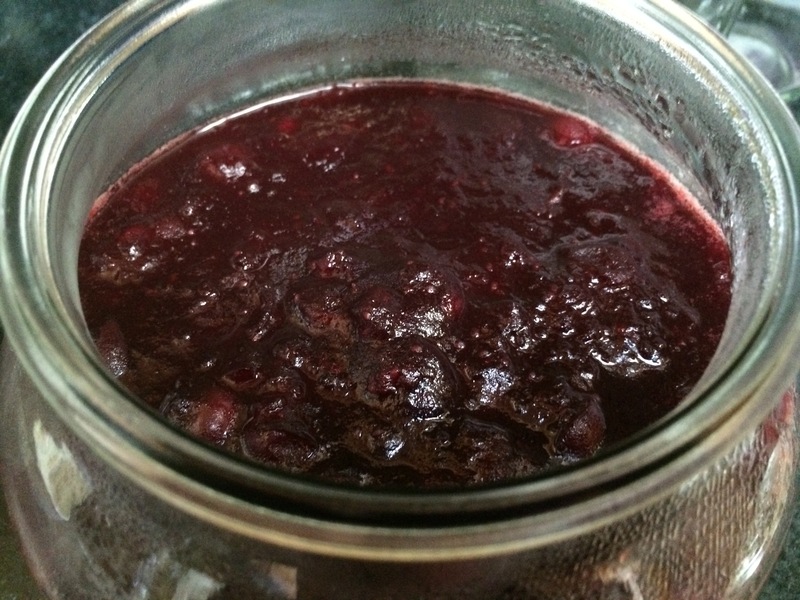 The natural pectin in the cranberries will make it gel as it cools. 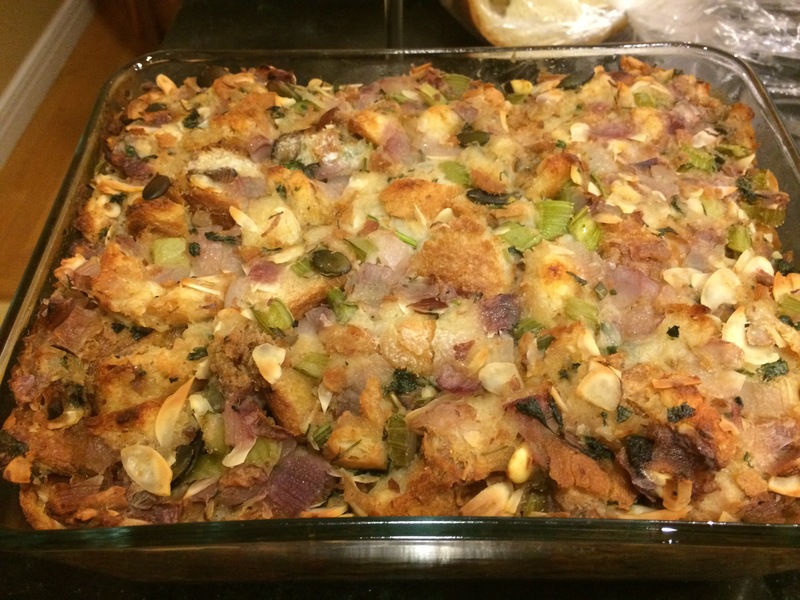 So one thing that I have learnt is that the mixture that one makes for stuffing the turkey with — which I love, by the way — is better baked separately in a casserole than in the body cavity of the turkey. The reason for this is that it actually takes longer to cook the stuffing all the way inside the turkey than it does to cook the turkey itself. 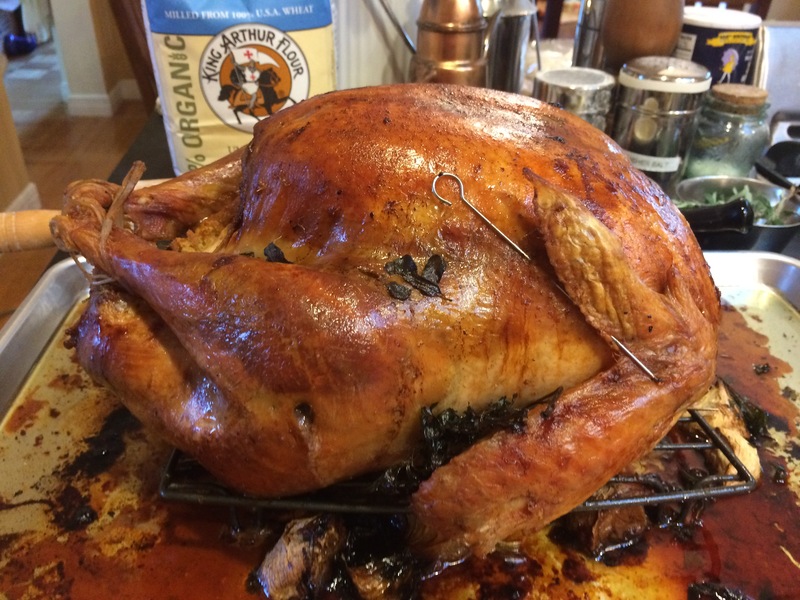 So you either have under-cooked stuffing or overcooked turkey. 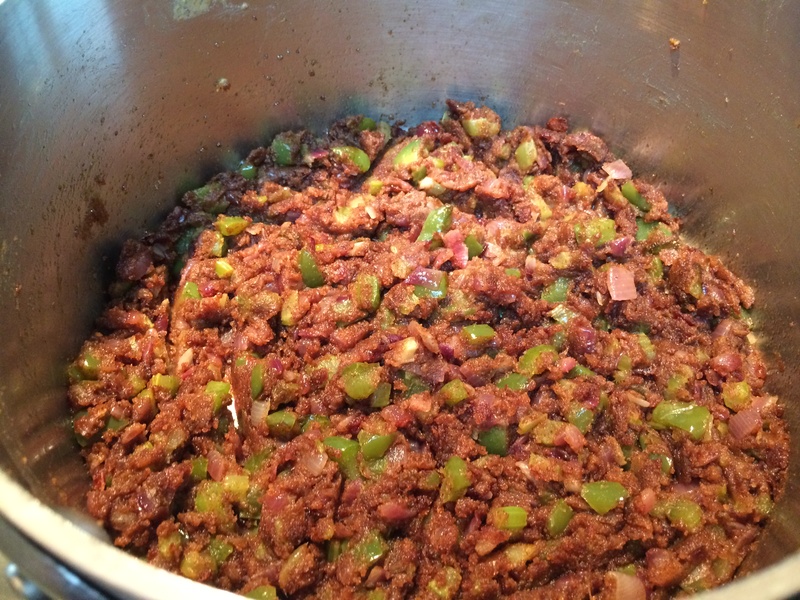 So…if you cook the stuffing outside, then…it is not really ‘stuffing’, is it? Of course it is, are we going to think up a new word for it? But…why not call it…bread-cubes-soaked-in-chicken-broth-with-onion-and — wait, are you going to name every single ingredient? Stuffing it is. Stuffing you don’t stuff with. 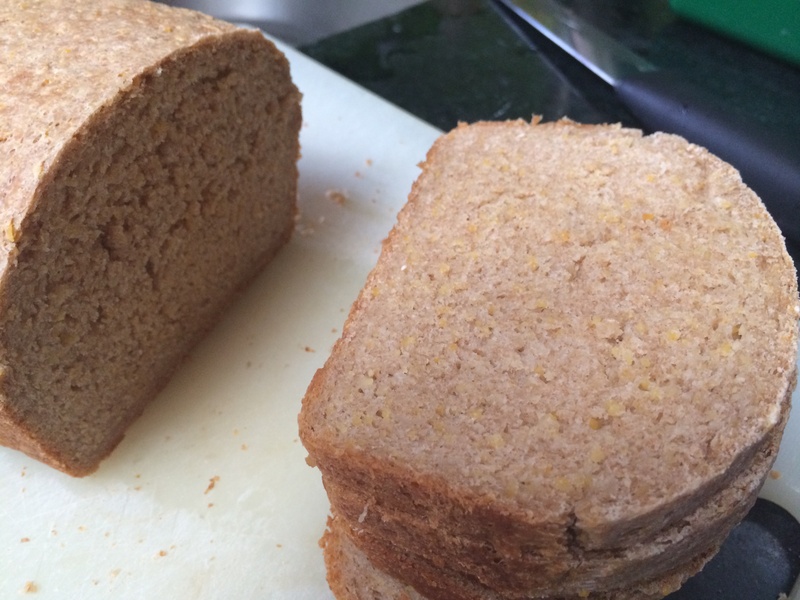 For this, I used 12 cups of stale, cubed French bread. Sauteed 2 chopped onions and 3 chopped celery ribs and some crimini mushroom stems ribs in a quarter cup of butter. 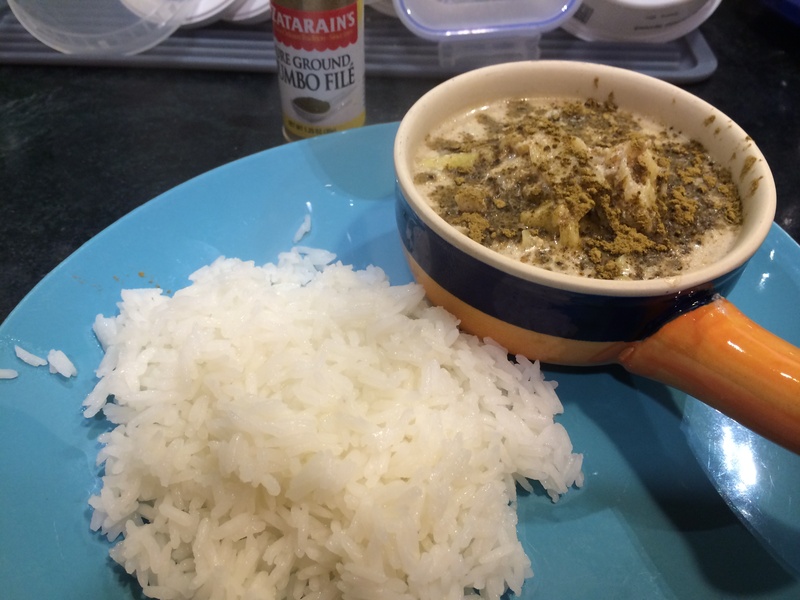 Added parsley and fresh sage from the garden. A cup of slivered almonds and a few raw pumpkin seeds. 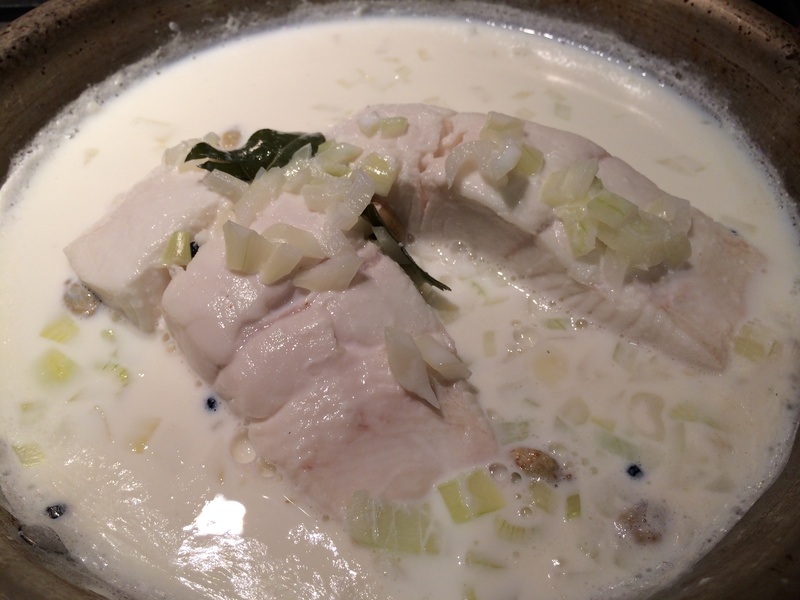 Toss with the bread cubes, drench the whole thing in warmed chicken broth until it is all nicely moistened — this took more than three cups. Instead of the regular potatoes my husband requested sweet potatoes because of their richer flavor. Important trick — these can be done ahead of time and saved in the fridge in a baking dish, all ready to go. On the day you want to serve it, they just go into a medium oven (covered) for about 30 minutes. All you have to do is add a little extra milk than you normally would. 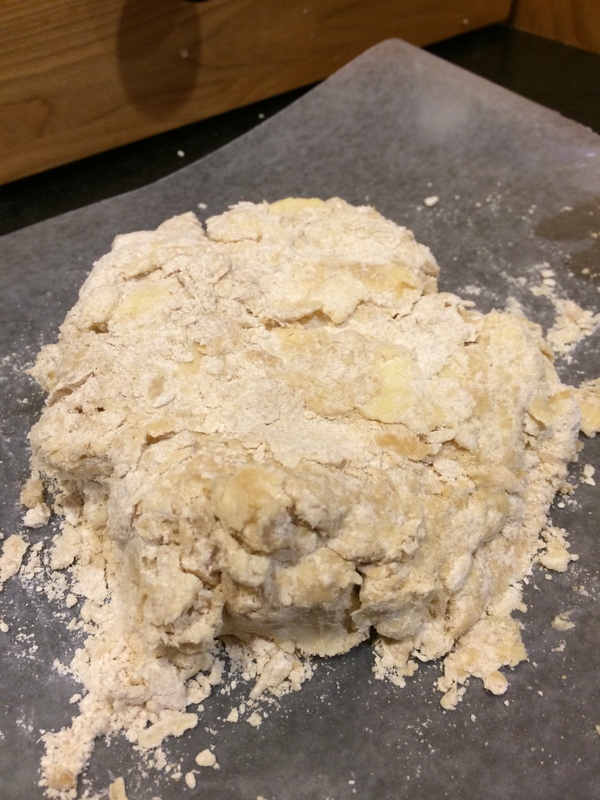 The texture has to be more runny than you would want; by the time it has reheated in the oven (along with the stuffing above) it will have dried a bit. 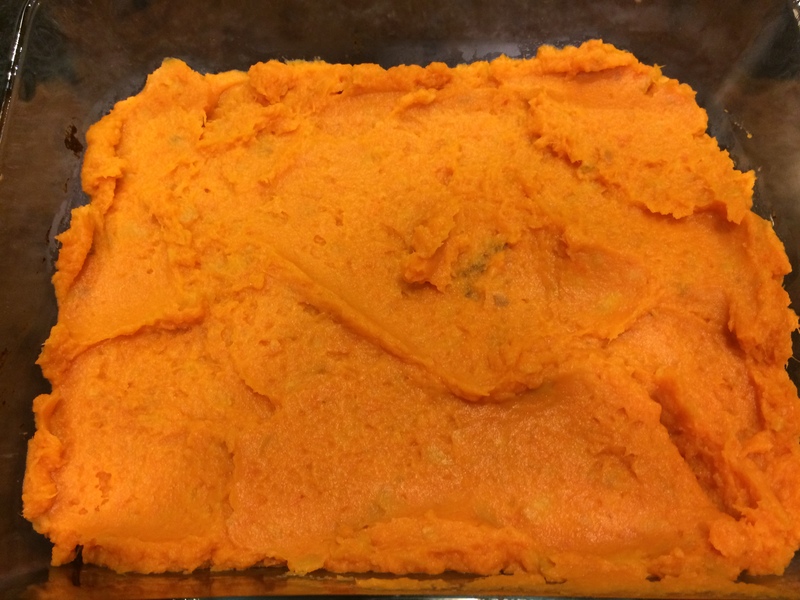 To boil the four large sweet potatoes (I refuse to call them yams, because the yam is actually this vegetable), I pressure-cooked them for 20 minutes. 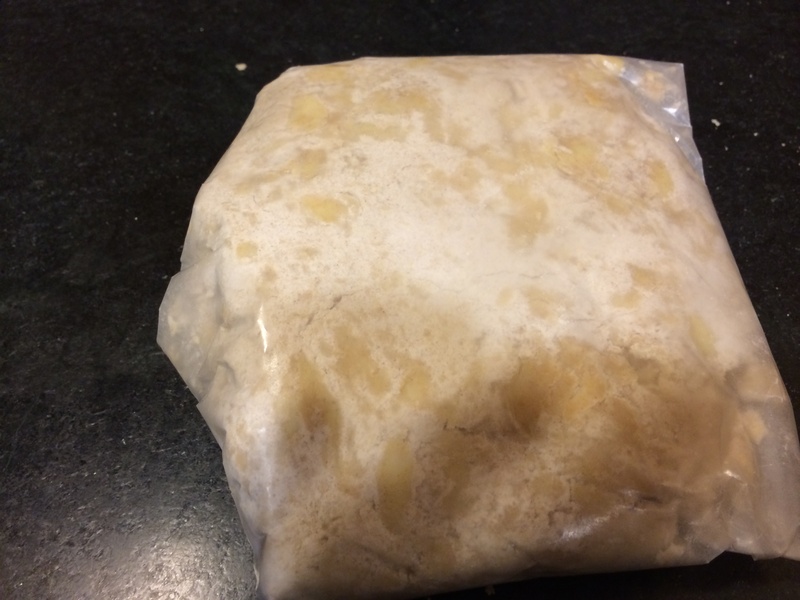 Peeled; then added some butter and salt and milk while mashing. Here is a vegetable for math geeks. 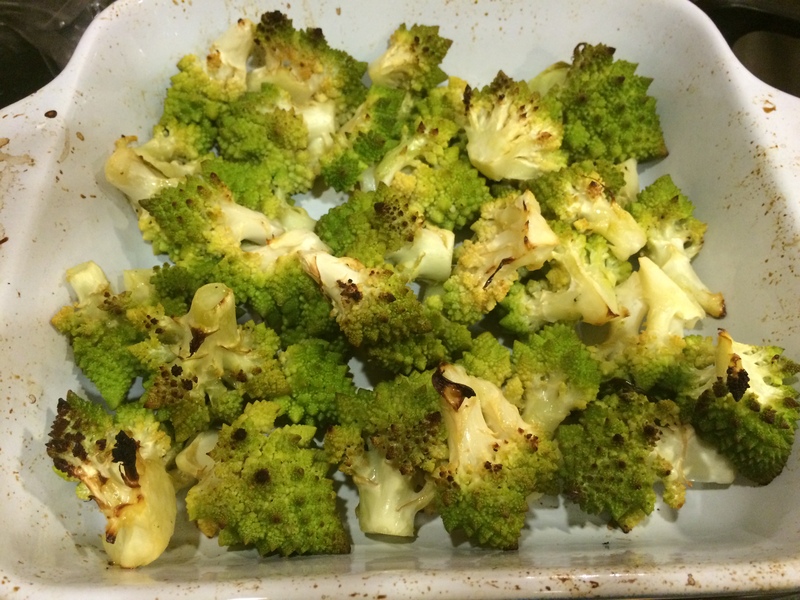 Romanesco broccoli is a variant that was found in Italy. The number of spirals on its head is from the Fibonacci sequence. Each little flower-head has the same shape as the entire head — so it approximates a fractal. 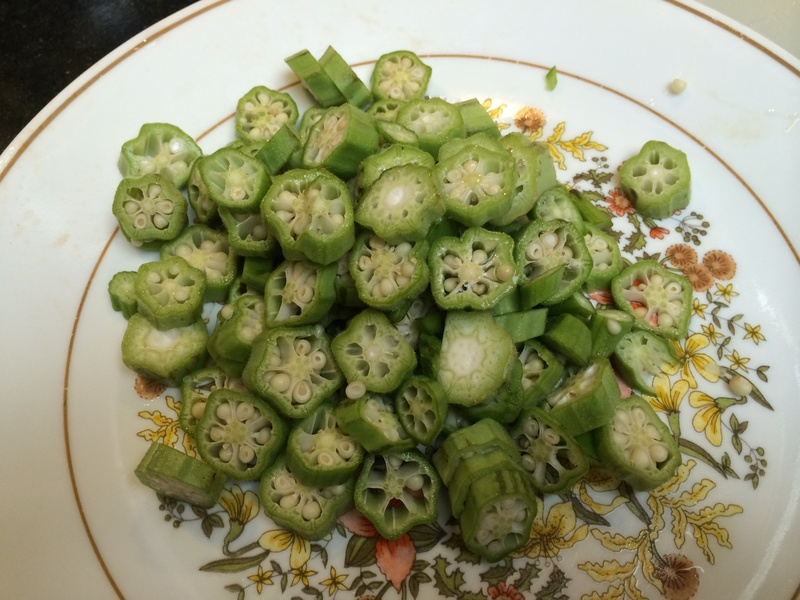 Don’t care about the math stories your vegetables are trying to tell you? Well it tasted great and is a particularly festive looking vegetable. I microwaved them to cook them lightly, then stuck them under the broiler for a few minutes to brown them. I roasted the turkey with vegetables strewn around it cut up in big chunks. 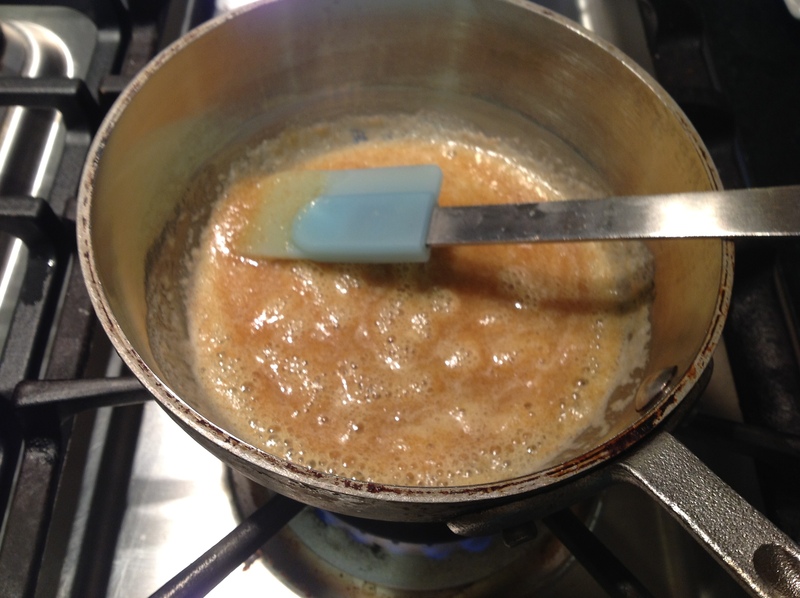 Not only are they delicious when they are done cooking, but make for a lovely pan drippings gravy. As a matter of fact that was the highlight of the meal. 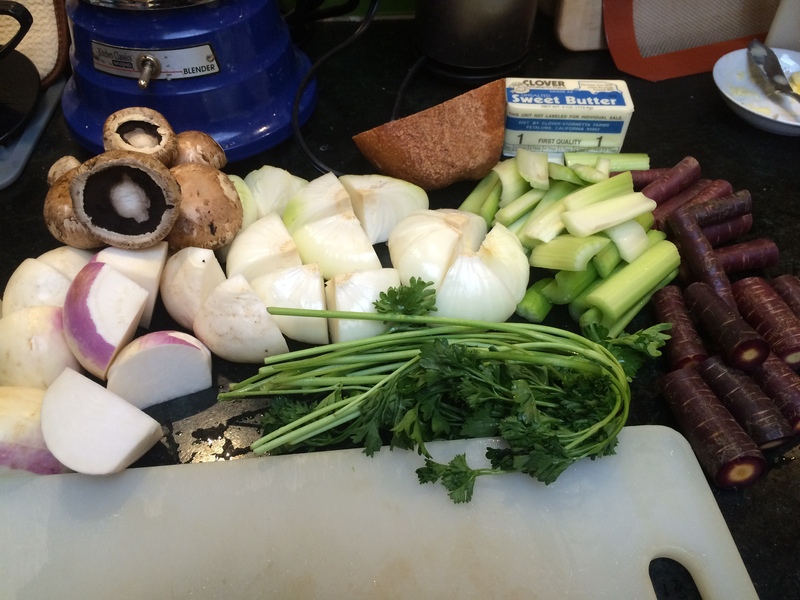 Here are the vegetables I used — turnips quartered; cipollini onions quartered; celery ribs, cut up in stalks; carrots cup up few inch long; crimini mushroom caps; small bunches of parsley. Lately wild turkeys have made a comeback in our corner of Northern California. Driving down windy hill roads, one sees small flocks of them along the sides, oblivious to human habitation. I feel a deep satisfied thrill upon seeing them, as though our generation has reclaimed a bit of wildness that had been lost forever. Then, I turn my thoughts to the domesticated turkey that is raised for food, and how lacking a life it has compared to its wild cousins. I did the best purchase I could, finding a turkey that the makers claim has had a decent life. So when it comes to being thankful, I would like to thank the turkey. 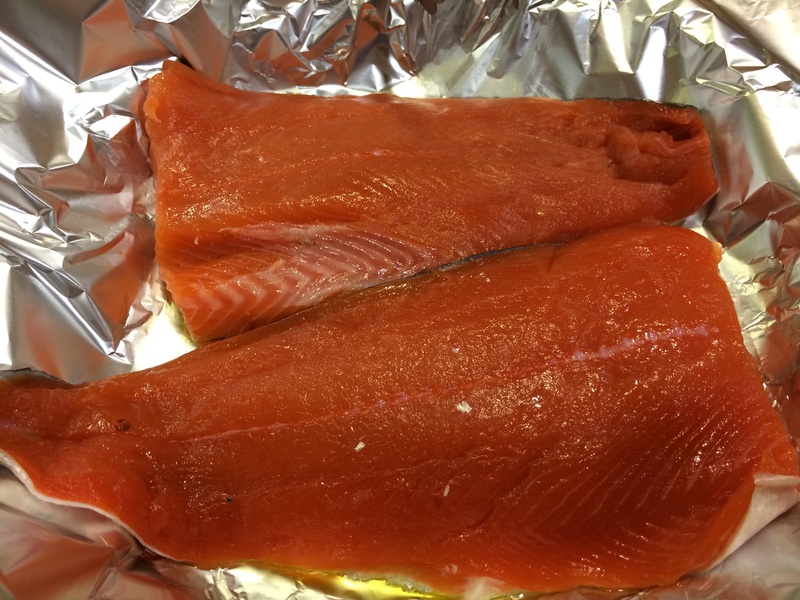 Take it out of the fridge a few hours early to bring to room temperature. 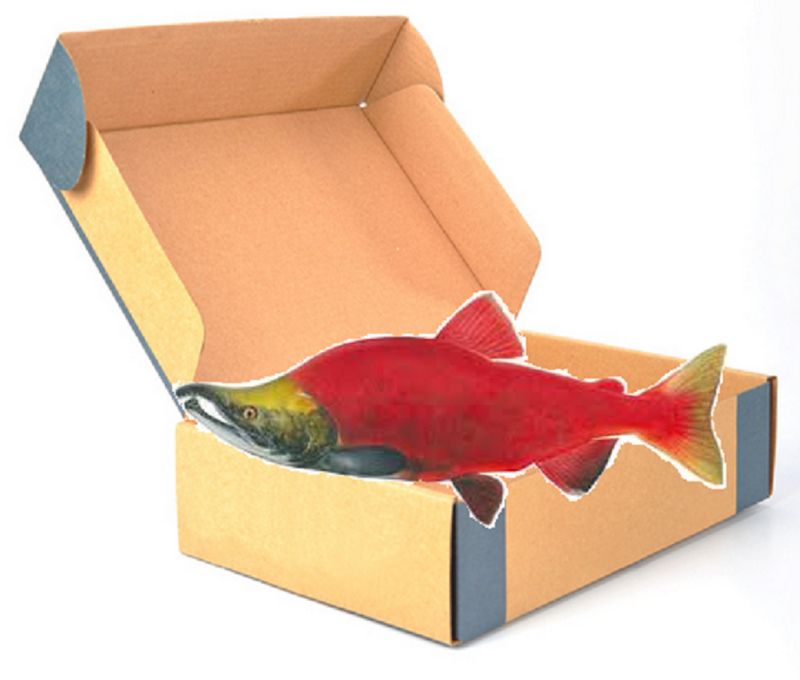 Leave it overturned in the sink to drain the cavity as much as you can. The rest of the liquid must be dried with paper towels. Lately brining has become very popular, where the entire turkey is soaked in a salt water bath overnight. While this makes for moister flesh, we don’t prefer this in our family because the meat then tastes ‘brined’. Hard to explain, but we have never taken to it. Also the pan drippings simply can’t be as rich and caramelized, I’m guessing, because of the salt water that would be dripped out of the turkey. To prep, rub about one and half tablespoons of kosher salt all over the inside and outside of the bird. 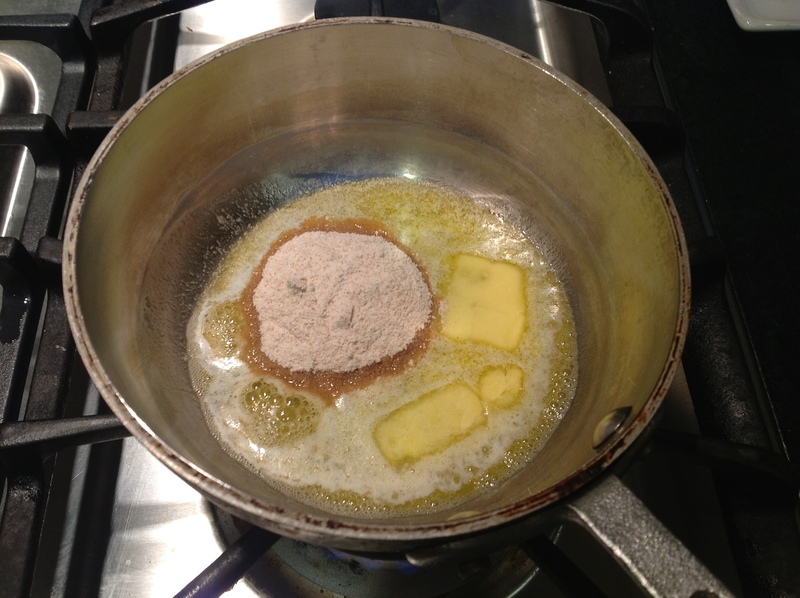 Rub about a quarter cup of softened butter all over also. Rub some butter in between the skin and flesh of the breast. This skin is really quite easy to slip one’s hand under. I also deposited some fresh sage leaves under the skin in various places. 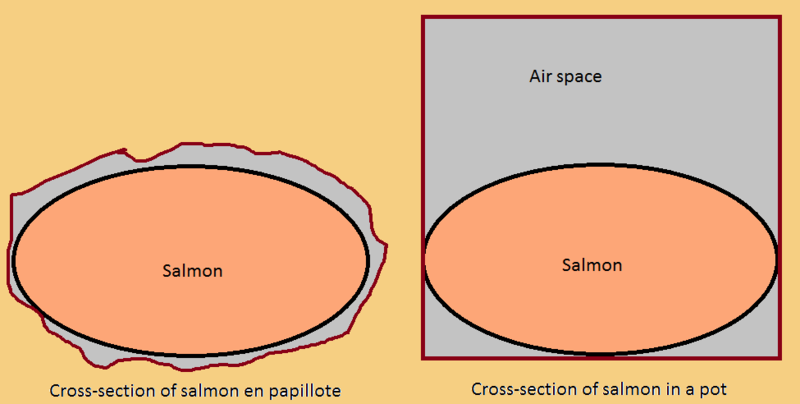 The point of doing this is to keep the breast meat moist and allow the skin to brown. Leave it unstuffed. I didn’t. I did put some big chunks of vegetables into the cavity because I could not resist filling it. But ultimately, it just slowed down the cooking, and it never achieved safe temperatures, and we just discarded it. 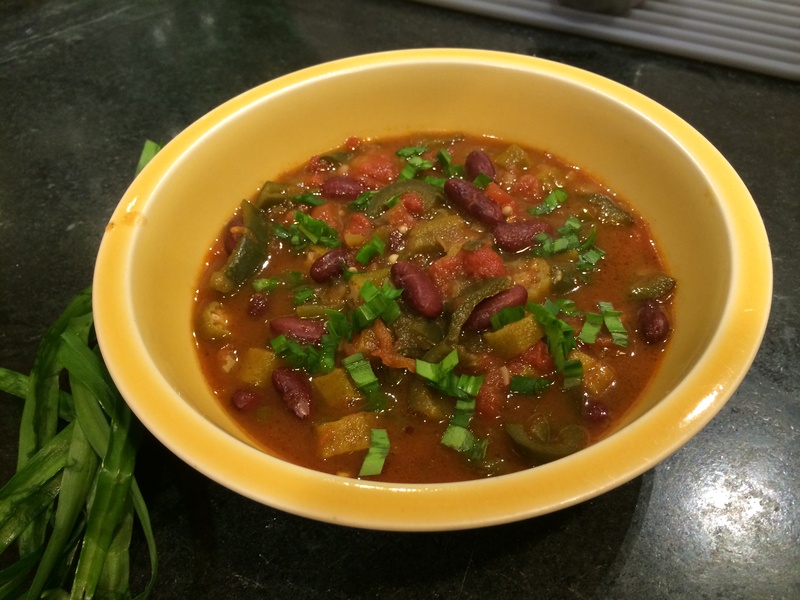 The vegetables strewn around the sides were much better. Use the ‘convection’ setting in your oven if you have it, and if you have a ‘roast’ versus ‘bake’ use the ‘roast’. Use the meat probe if you have one, and stick it into the deepest part of the thigh. 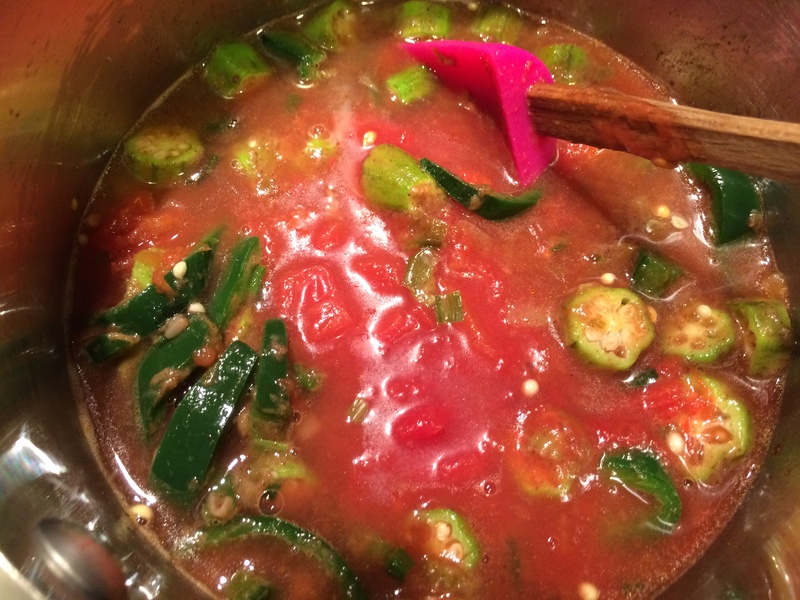 Set it to 165ºF. Pour about half a cup of chicken broth or water in the roasting pan. Choose a wide, sturdy pan with a low brim. This is to allow air to circulate around the turkey. Also set the bird on a rack for the same reason. Start the roasting high — at 425ºF. Turn it down to 325ºF after 15 minutes. 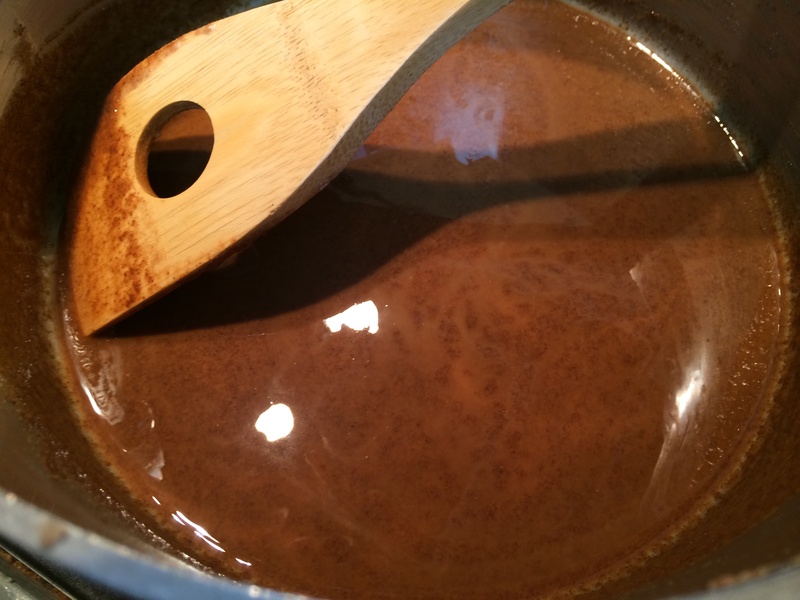 This will allow it to brown right away, and come to the correct internal temperature more slowly. 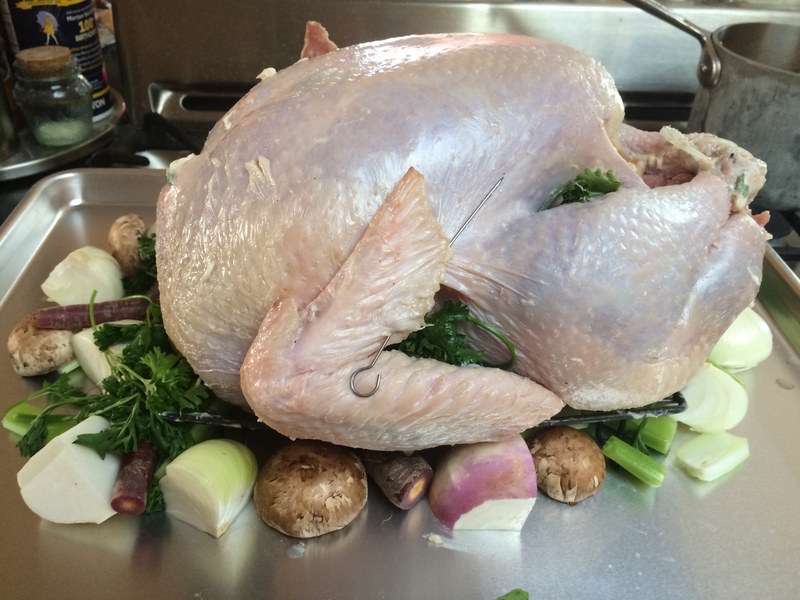 Once the meat probe shows about 140ºF, tent the entire turkey under foil, so it does not burn. 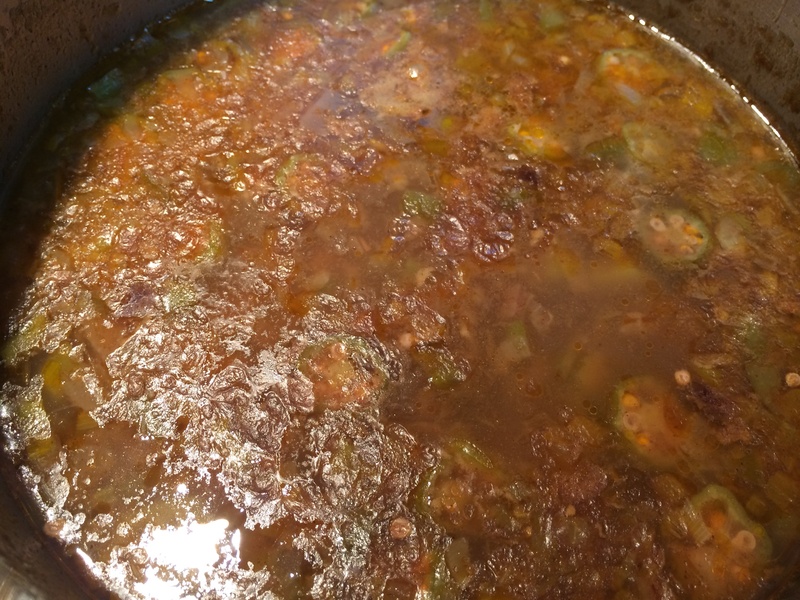 The vegetables strewn around will deepen in color right away, and soon start frying in the fat that drips from the turkey. If any of the pieces threatens to char, lift it out of the pan. Baste the breast once every half hour or so. It will take about 3 hours for a 15 pound turkey, unstuffed. This was the highlight of the meal, and I needed to do almost nothing to make it happen. Have a look at the rich brown drippings on the roasting pan above. All that needed to be done was to lift the turkey out, lift the large chunks of vegetables out to serve with the turkey, and scrape the rest into a little pot. Over time, the fat cooled and rose to the top, so it was easy enough to spoon it off. 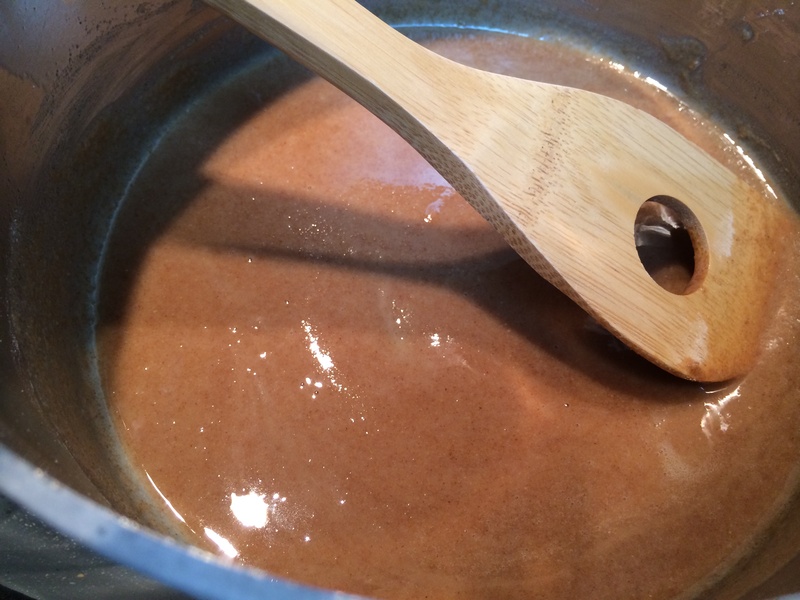 The rest of the caramel brown liquid made for an excellent rich gravy. 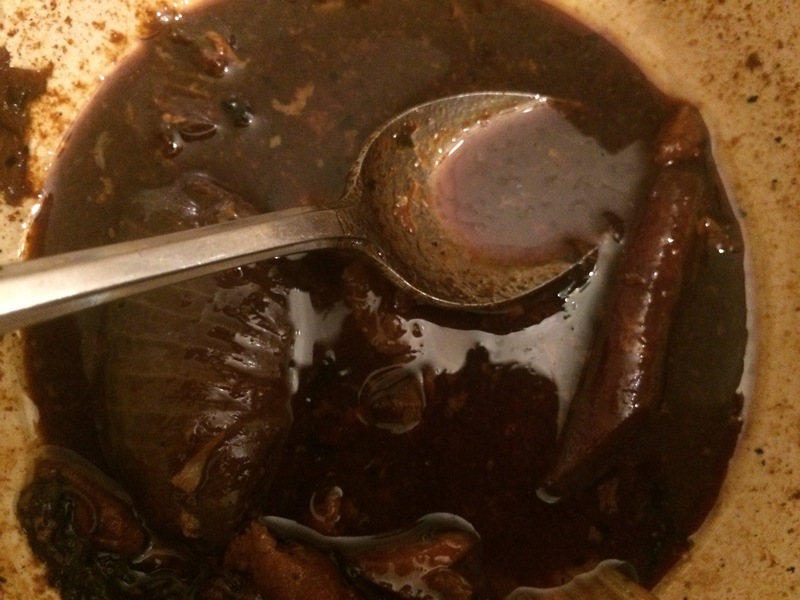 ¹Of course, since garam masala is not a fixed recipe but uses ‘warm’ spices like cloves, nutmeg, ginger, and allspice, you could say that I did indeed use garam masala in my pumpkin pie filling. If by reading the title you expected intrigue and a spy-vs-spy story, you came to the right place. The story of Salad Olivier begins in Czarist Russia when wealth and luxuries were not yet verboten. A Belgian chef known as Lucien Olivier came to Moscow in the 1860’s bearing secrets of French cooking. 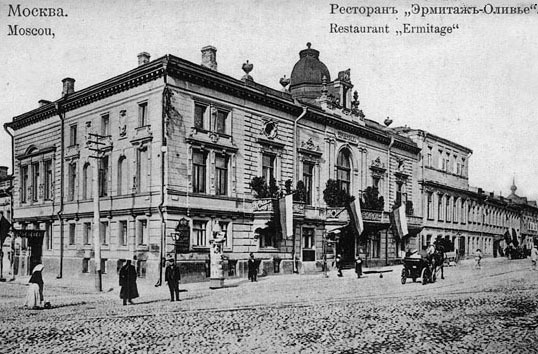 He opened a fancy-shmancy restaurant in Moscow called The Hermitage. This was not a one-room affair, rather an entire building with multiple dining rooms. Here Chef Olivier served a salad with every manner of luxury ingredient and choice meat — caviar, capers, game hen, crayfish tails. He called this the Salad Olivier. Of course, he did not invent this salad out of his sheer imagination but rather based it on a famous dish from Provençe known as Le Grand Aioli. This is essentially a feast of vegetables and meats, laid out separately to serve with aioli, which is basically a mayonnaise with garlic and mustard. He served his salad in layers, the ‘Provençal sauce’ on the side, to be poured over. His Russian customers would dispense with the niceties and simply mix it all up. So he followed their lead and Salad Olivier was served the Russian way, all mixed up with his Provençal sauce. Salad Olivier made his restaurant famous; although the main ingredients of the salad were obvious for all to see, he never divulged the secret of what went into his mayonnaise. Now remember that mayonnaise at the time was a French import, not ubiquitous on every grocery shelf from Japan to the United States. It had to be made by hand. It is an emulsion, which means the liquids involved in it are so well mixed together that it is impossible to tell what went into it. So as you can see, mayonnaise is inherently mysterious. So is milk, another emulsion. Sorry for the bad pun, but Lucien Olivier milked it. The secrets of his mayonnaise remained hidden until his grave. They had to come to his restaurant for the salad, or else go without. But then, a disgruntled local employee called Ivan Mikhailovich Ivanov tricked him into leaving his kitchen momentarily while the famous mayo was being whipped up. He managed to note down the ingredients, left the restaurant, and began selling his facsimile of Salad Olivier at a different restaurant, under the name of Capital Salad (Stolichny Salad). This stolen salad was never quite as good as the original, but it did mean that the rest of middle-class Russia was able to partake in it. With the revolution came the backlash against all things bourgeois, and this salad was stripped of its more expensive ingredients. 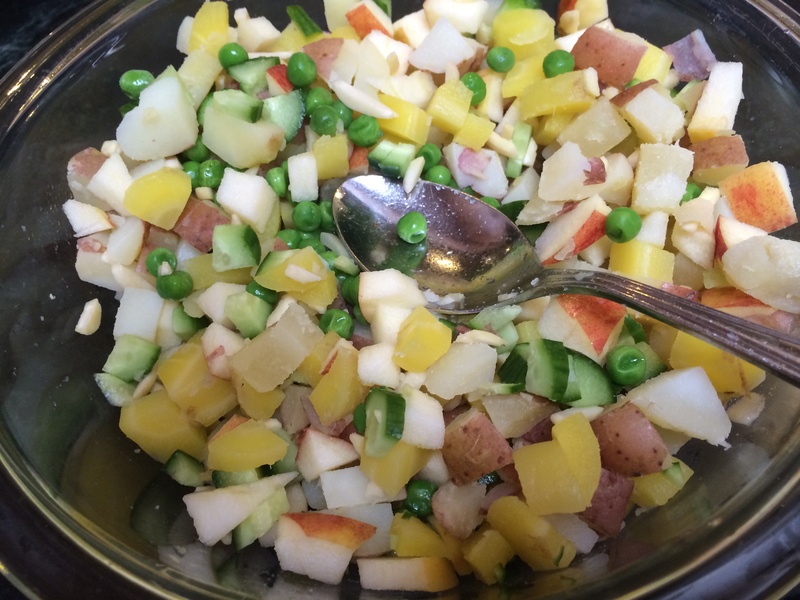 A sort of consensus developed around a small set of ingredients — potatoes, hard-boiled eggs, boiled chicken, peas, pickles. From Russia it spread to the Middle-east and Asia, and to India. 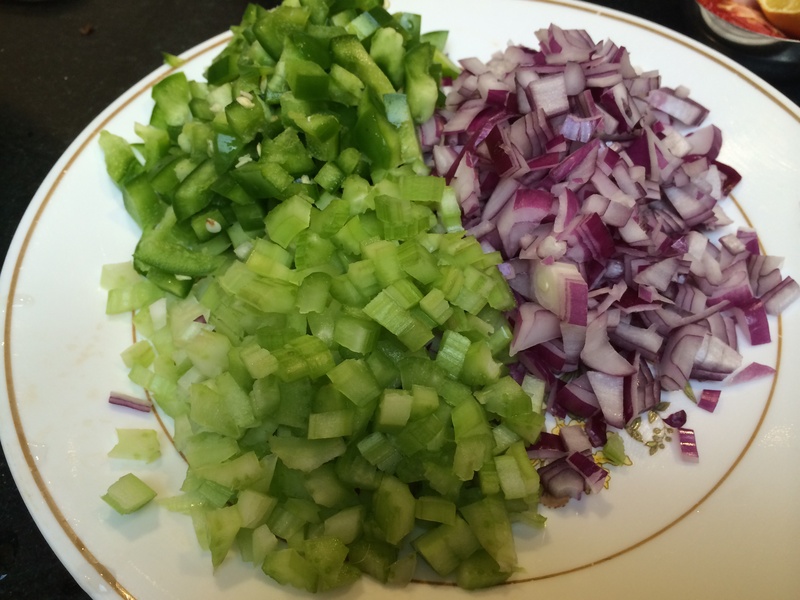 Growing up, my introduction to Russian salad happened in a vegetarian restaurant in India that avoided the chicken. 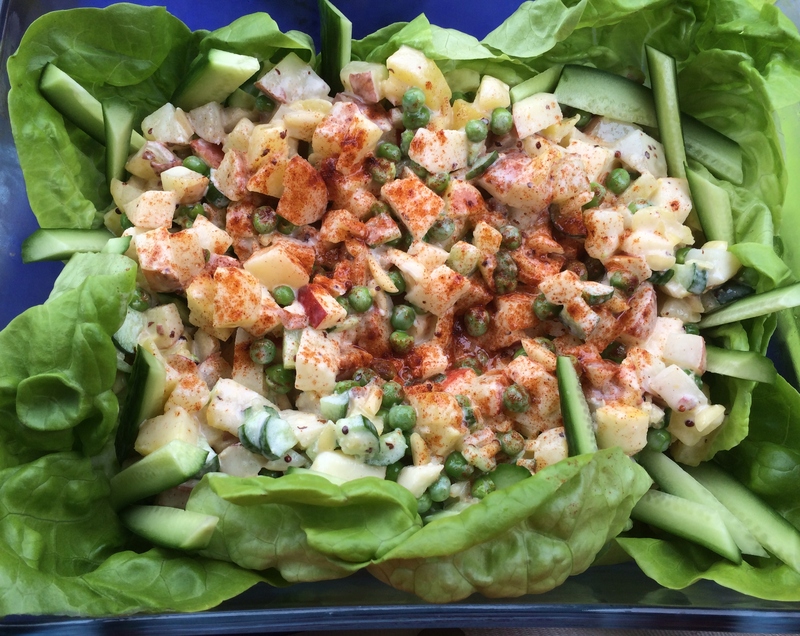 Somewhere en route from Russia to India a very important modification was made to it — Russian salad in India always includes chunks of some crunchy fruit — pineapple, apple, etc. In my opinion this is the best part. In fact that makes it, to my palate, more delicious than the potato salad that is traditional for July 4th barbecues, so that is what I brought to a friend’s. Any hint of treason is purely for taste. First the mayonnaise. 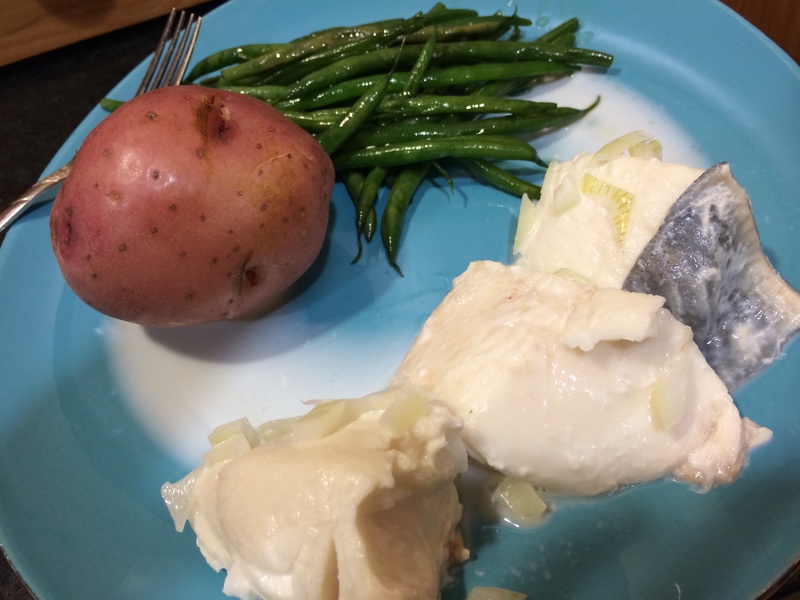 Lucien Olivier’s mayonnaise was an aioli, which includes garlic and mustard. 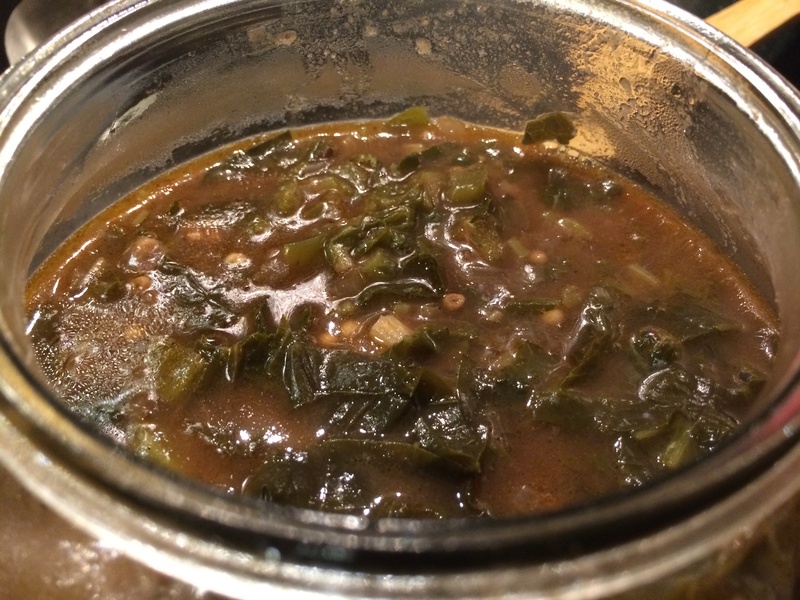 I used this recipe (which used this recipe) and whipped it up in a jar. 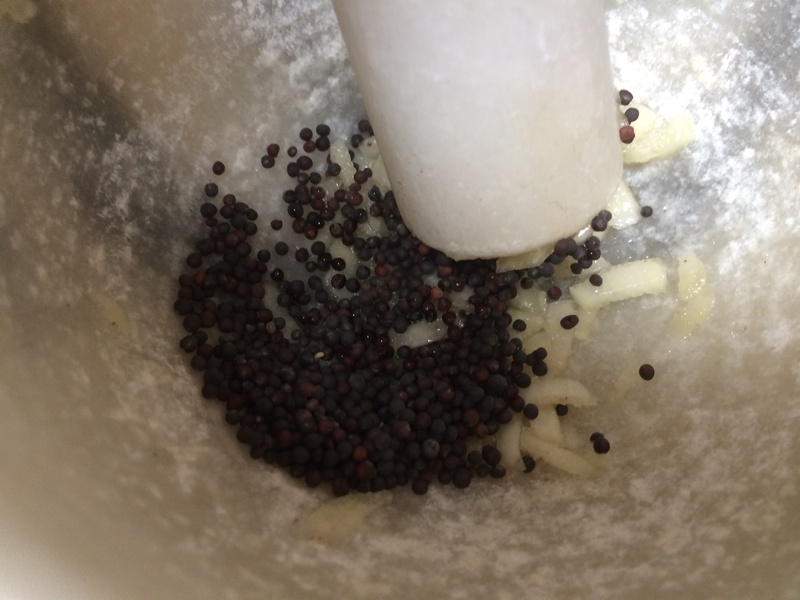 Put minced garlic and mustard into a mortar along with a pinch of salt. Give it ten minutes to sit and then pound it to a paste together. You do not have to powder the mustard seeds completely. 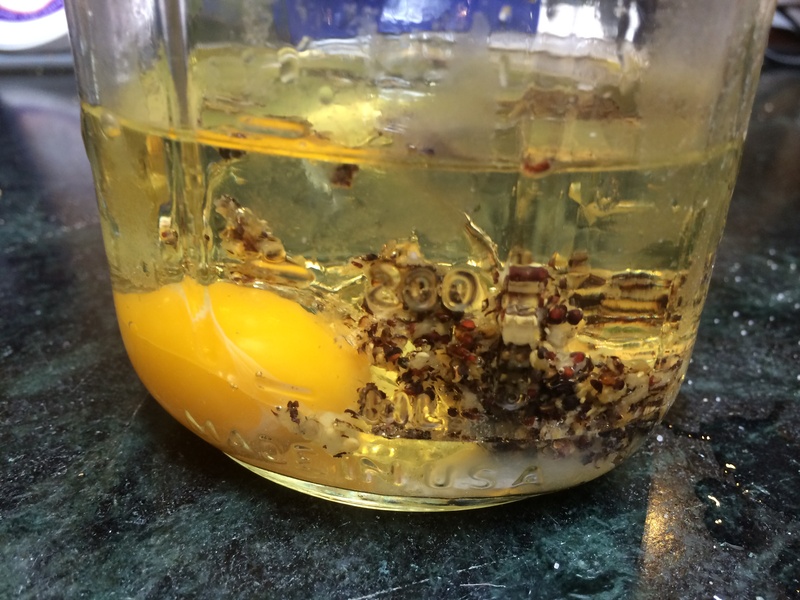 Put the oil, eggs, garlic-mustard, lemon juice in a Ball jar or Weck jar or empty jam jar. Using an immersion blender, whir it for just about 30 seconds or a minute. The mayonnaise should come together right away. 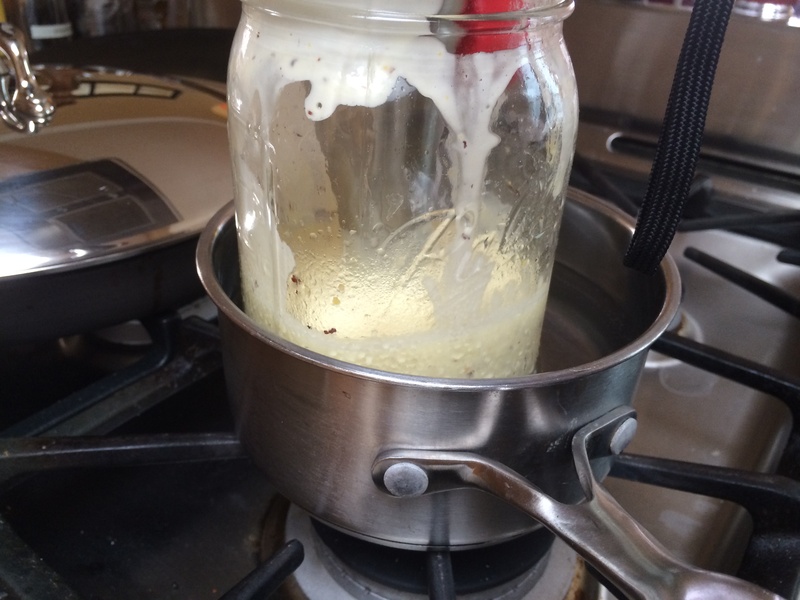 Now my salad was going to be sitting out in the sun so I chose to heat it up to to 135ºF in a double boiler while blending away. You do not need to do this, specially if you use pasteurized eggs. 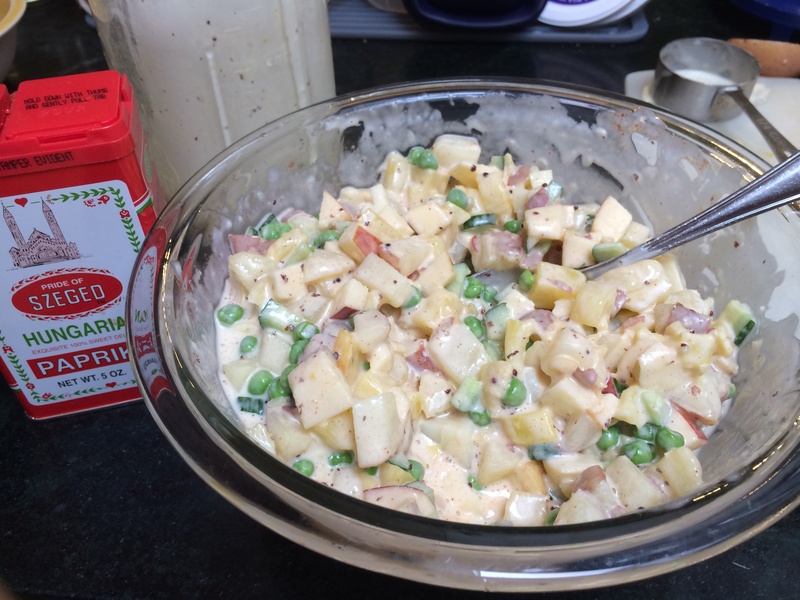 Now for the Russian salad, based on a French salad, made the Indian vegetarian way, for America’s Independence day. These are the ingredients I used, but please be creative and add whatever makes sense to you. 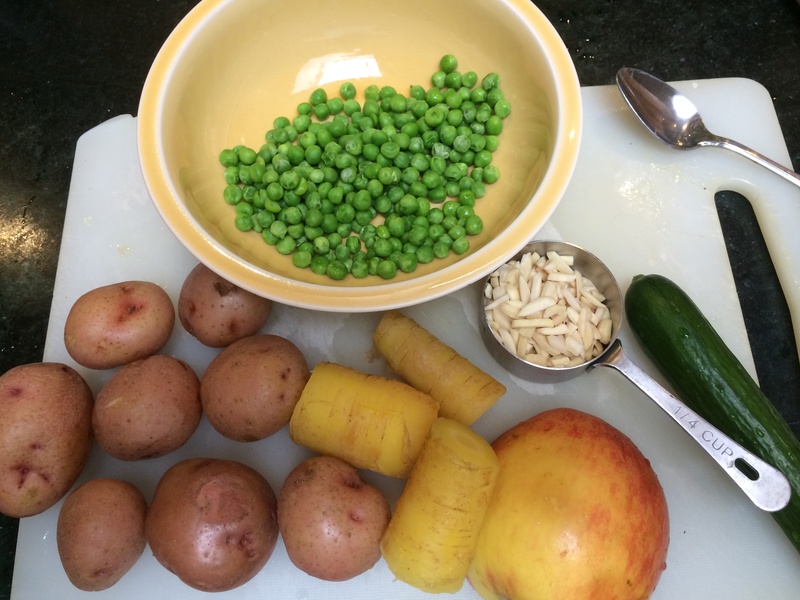 Boil the potatoes and carrots in their skins, in salted water. 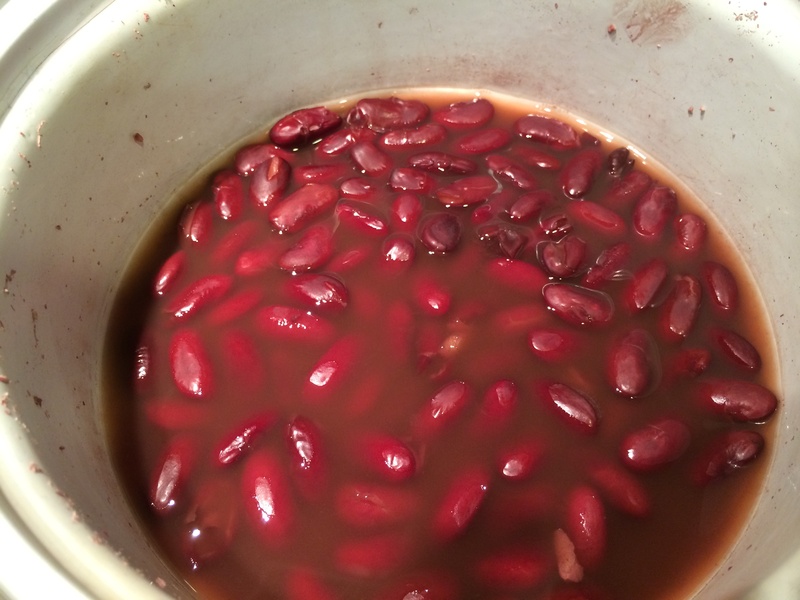 When done, drain, let them cool, then dice into small pea-sized pieces. Dice the apple and cucumber into similar sized dice as well. Leave the skin on (adds a nice colorful touch). Thaw the peas. 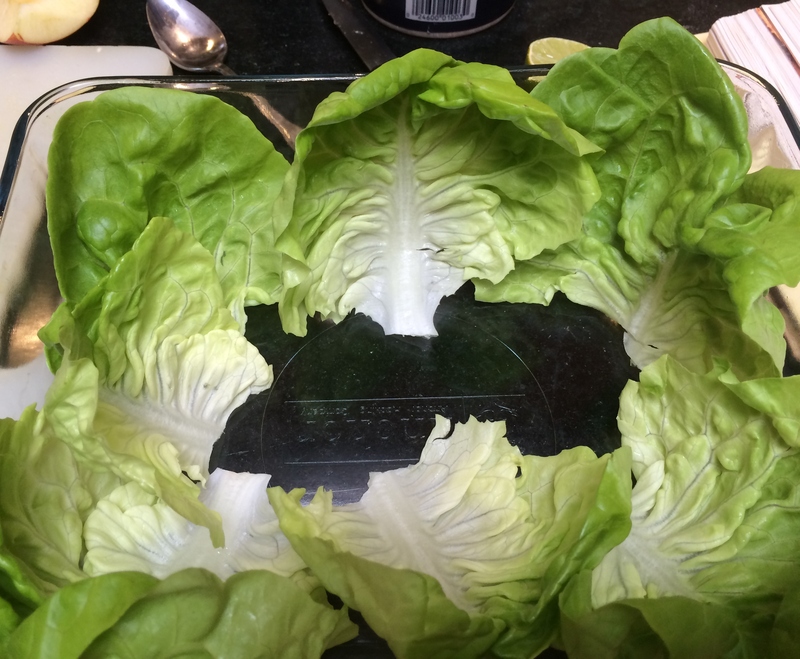 Line your serving dish with the lettuce. 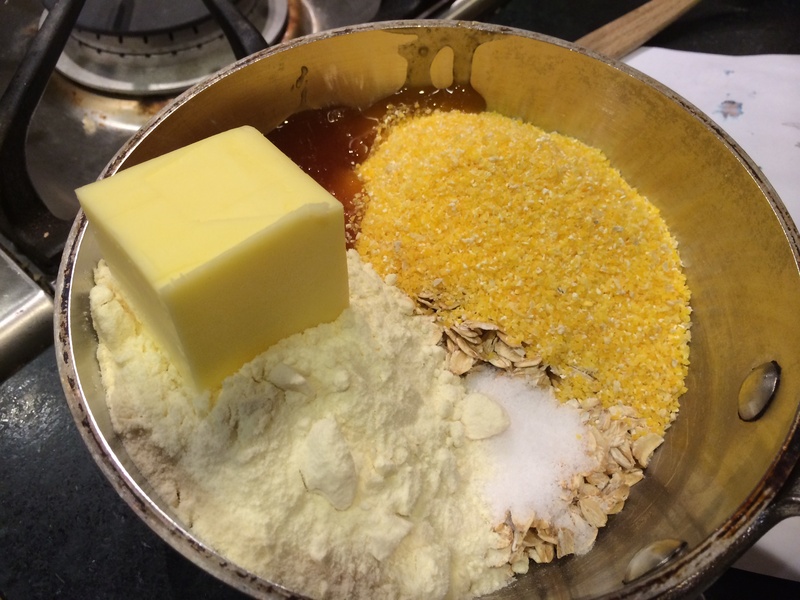 Mix the ingredients together in a mixing bowl. Add the mayonnaise, paprika, and salt to taste. Mix together nicely. Serve it out in the bed of lettuce. 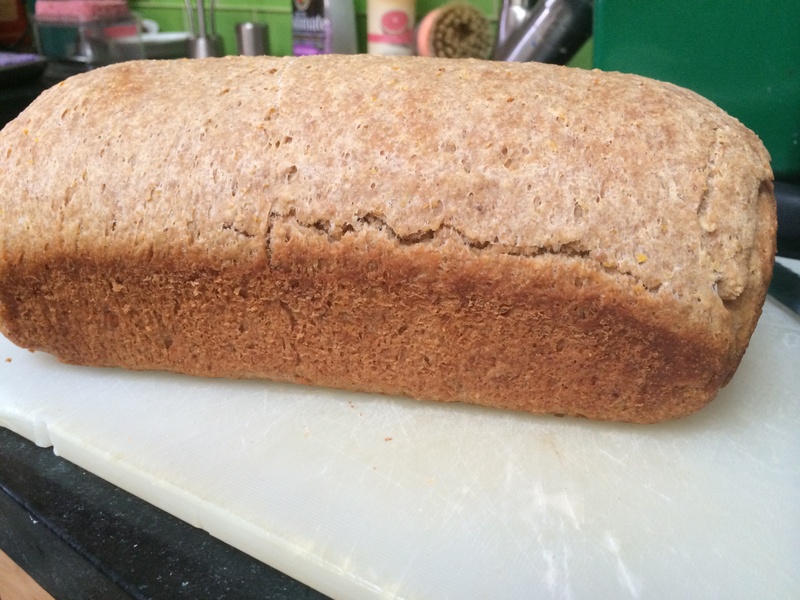 Several years ago, poking around google looking for an oat bread recipe, I found that an unknown denizen of the Internet had put up a good-sounding recipe under the name of ‘Habit Bread‘. I made it that very day. My husband, who is a big fan of oat breads (he has his toasted with almond butter), said that I had aced it on the first try. Since then, this loaf has become a standard in our family. 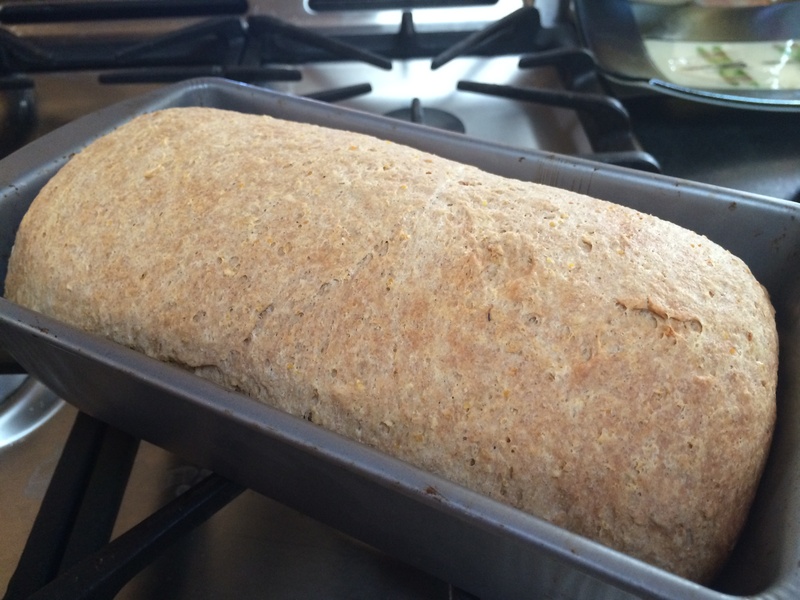 Like with every other recipe I have made modifications — I call my version the Husband’s Habit Bread. It is so much part of my husband’s weekly routine that I try to have a loaf sliced and frozen at all times. Here is a trick to storing loafs of bread, specially of this dense variety. One thing I have found is that the freezer works great, but unless one wants to thaw the entire loaf at once, it is better to pre-slice it. Then you can pull out one slice at a time. Go ahead, pull one out. What? You can’t?! You can’t because all the slices stuck together when they froze? Exactly. 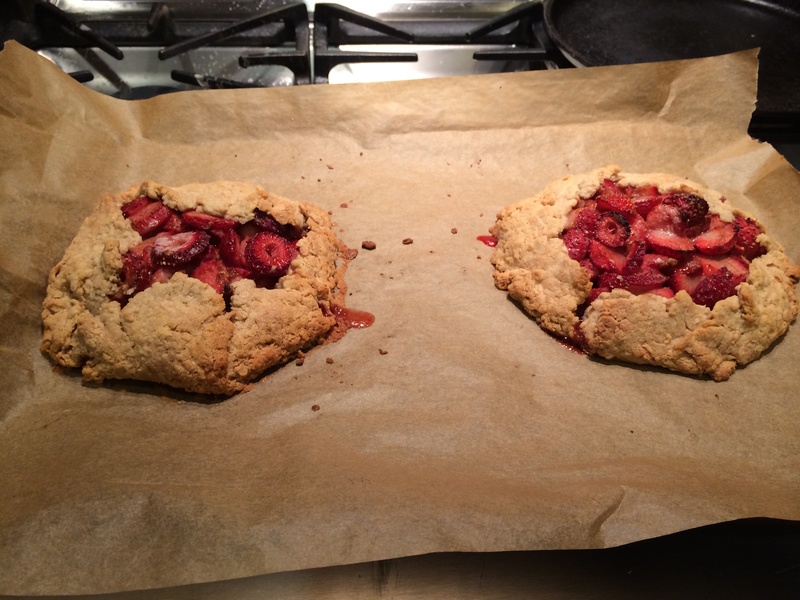 That’s why I put sheets of parchment or waxed paper in between each pair of slices before I freeze them. Put all the slices thus separated in a freezer bag, squeeze out as much air as you can from it, bind it tightly and put it in the freezer. 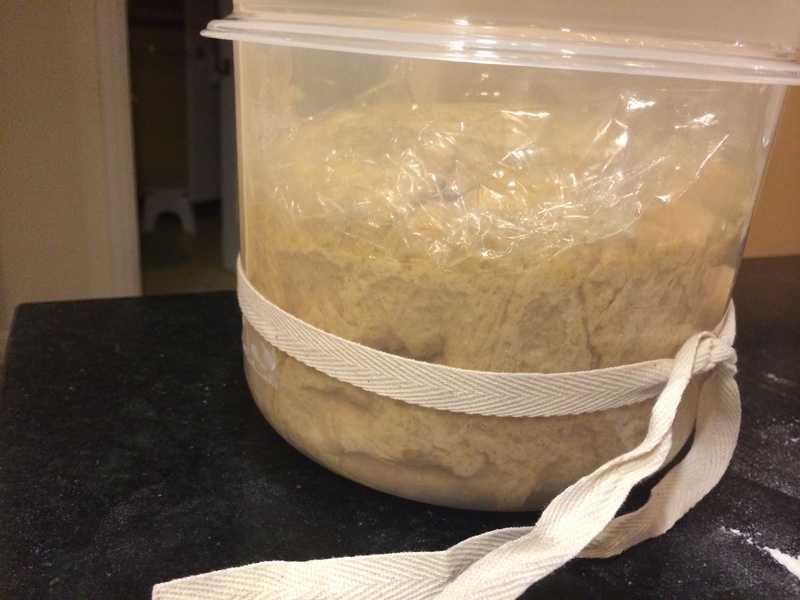 This recipe makes one 9″x5″ loaf. 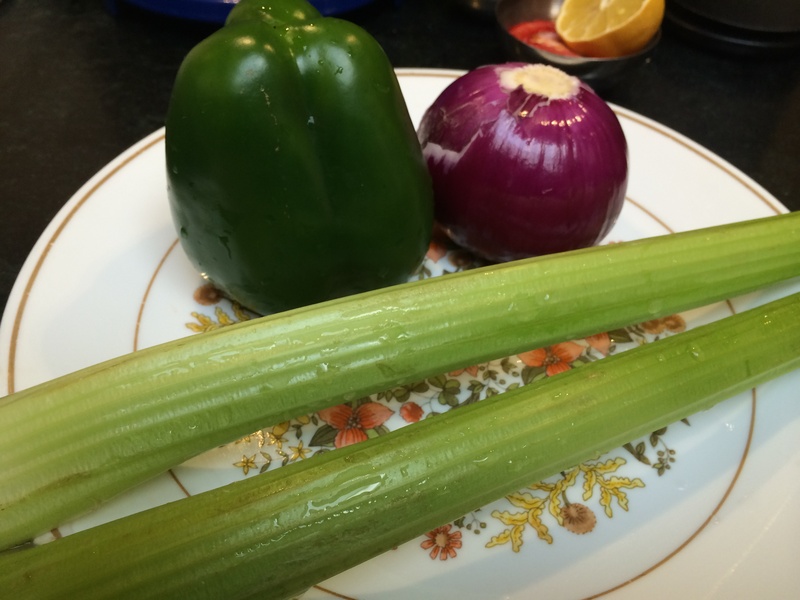 Combine all the wet ingredients together into a pot and bring to a gently boil. Stir nicely to get it all to combine, paying special attention to breaking up the dry milk lumps. 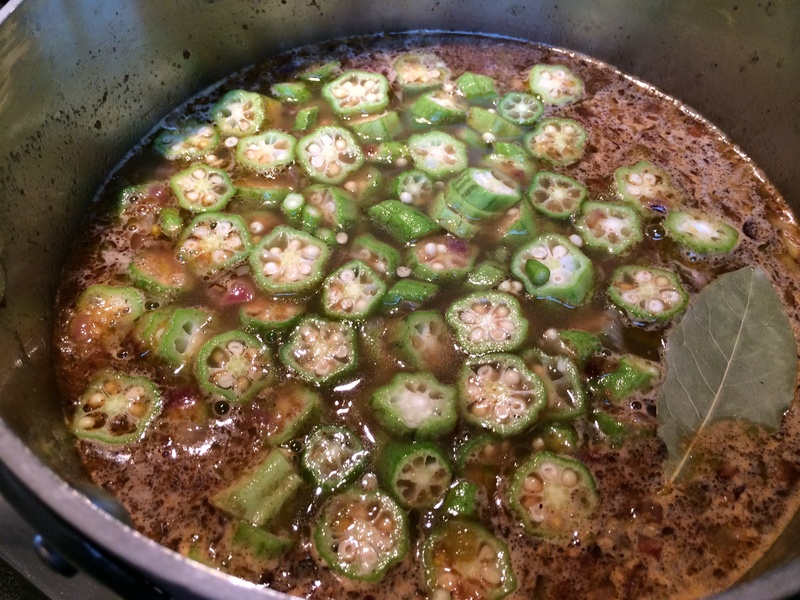 Once it comes to a boil, turn off the heat and wait for it to cool. 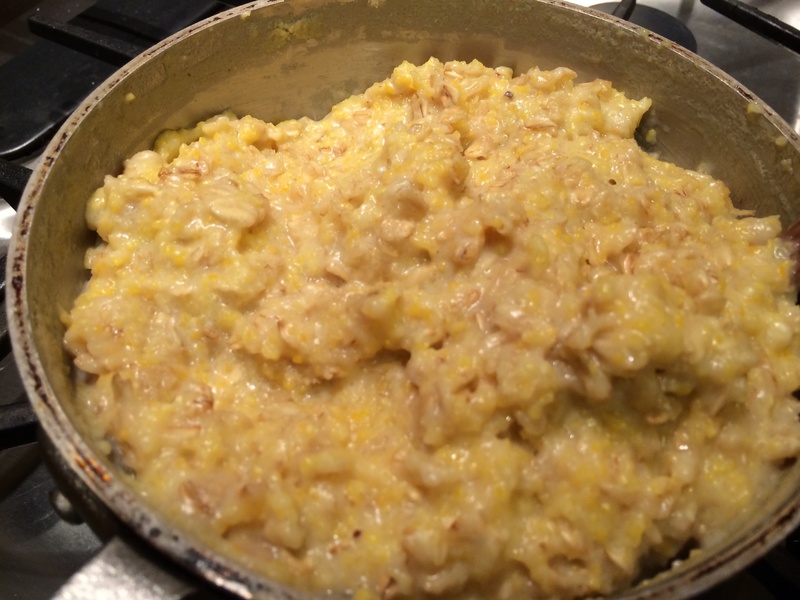 The unknown denizen of the Internet who is the originator of the Habit Bread recipe mentions that a bowl of cooked oatmeal is notorious for holding onto heat and that is true. It takes a while for this mixture to cool to lukewarm. 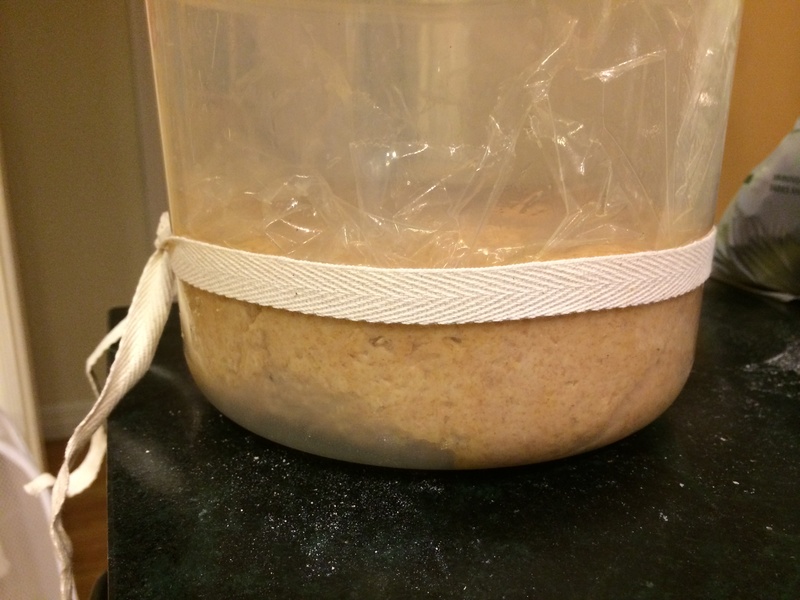 At the same time, you don’t want to wait too long, because then the mixture will turn into a giant lump and the bread will not mix very well. I have found through trial and error that this time period is about half an hour; but test before using. 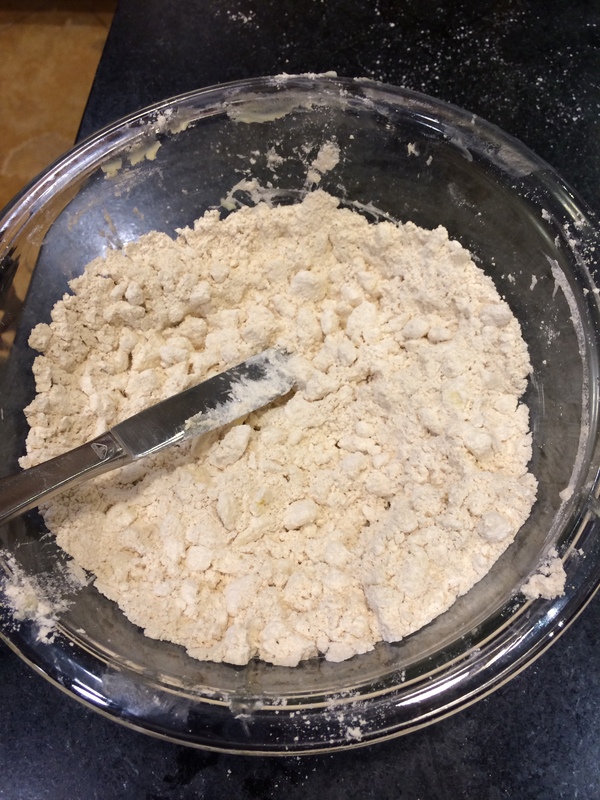 Meanwhile combine the dry ingredients in the bowl of a mixer; if you choose to knead by hand, just combine in a large bowl. 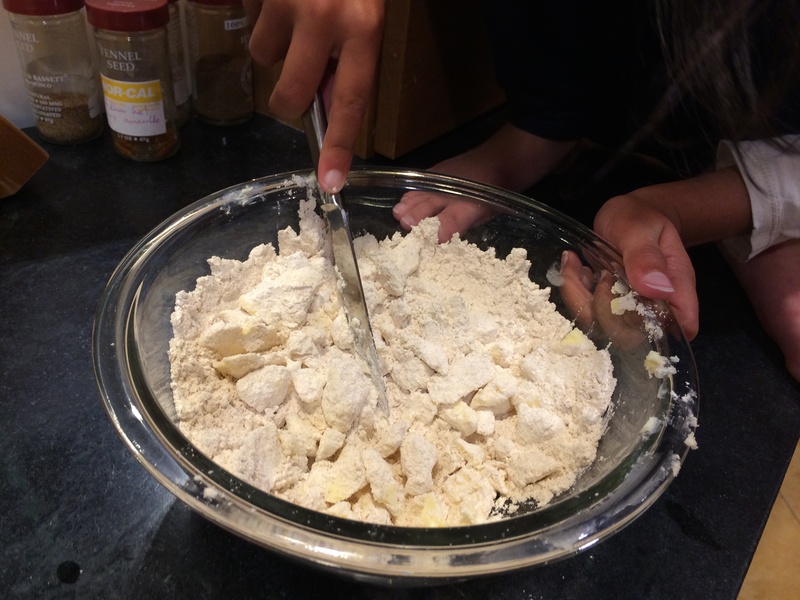 Stir the flours with a fork. 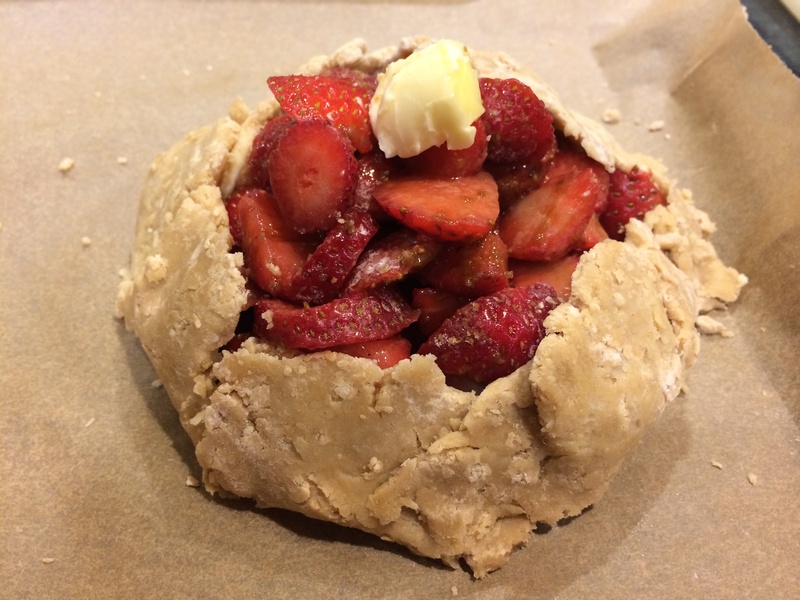 Put the (lukewarm) wet ingredients in and stir with the dough hook for about 3 – 4 minutes until the dry ingredients are moistened. 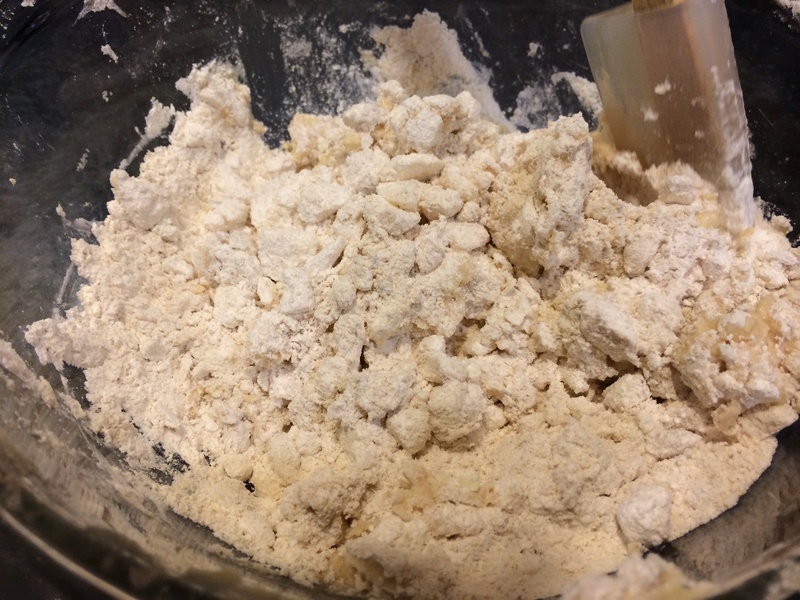 You may find you need to add up to 1/4 cup extra water while kneading. Leave it covered with a plastic wrap for about 10 to 20 minutes. Come back to it; by this point due to the autolyse process the dough will be much easier to knead into a smooth ball. Turn on the mixer with the dough hook for another few minutes or so; first the dough will come together into a shaggy mass. I like to finish kneading by hand until maximal smoothness. 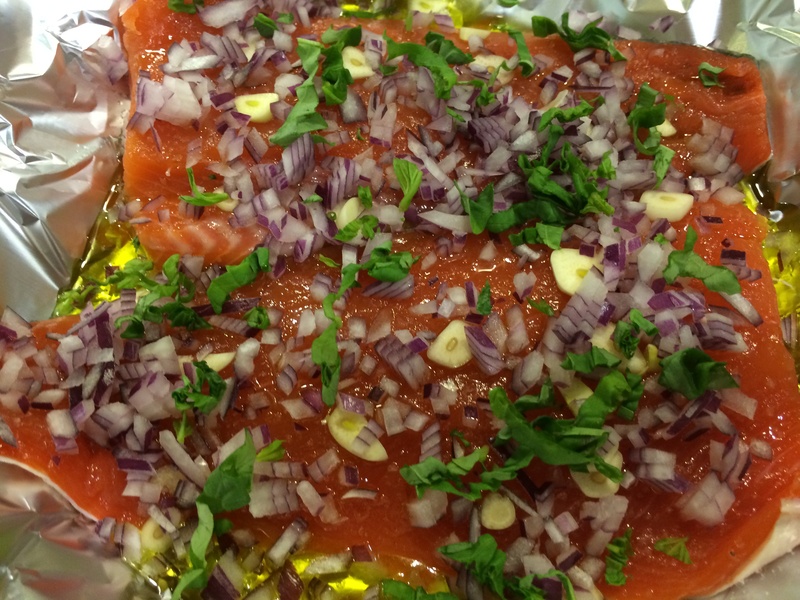 Cover with oil and let it rise at room temperature in an oiled bowl for about 2 hours. It should double in volume. 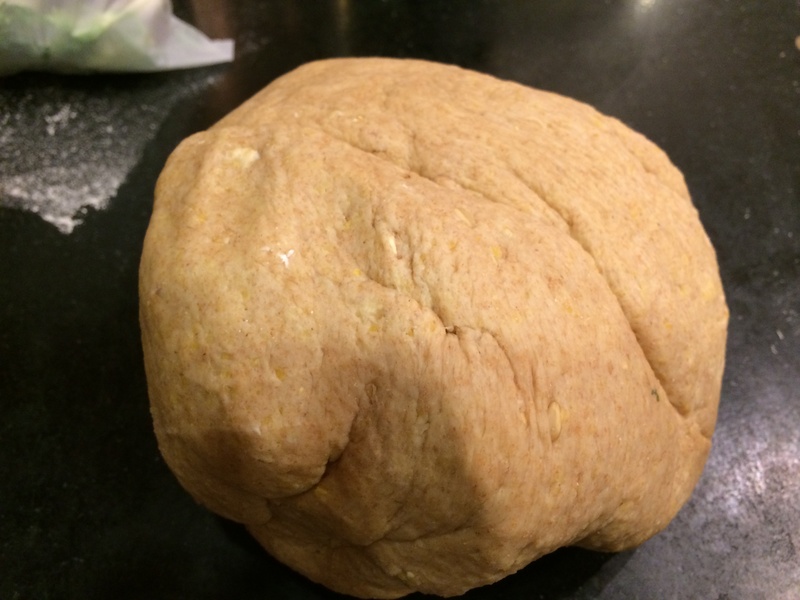 Take it out of the bowl, flatten it gently into a rectangle and roll into a loaf, while taking care to tuck the ends in. Squeeze the seam shut all the way across to seal it. 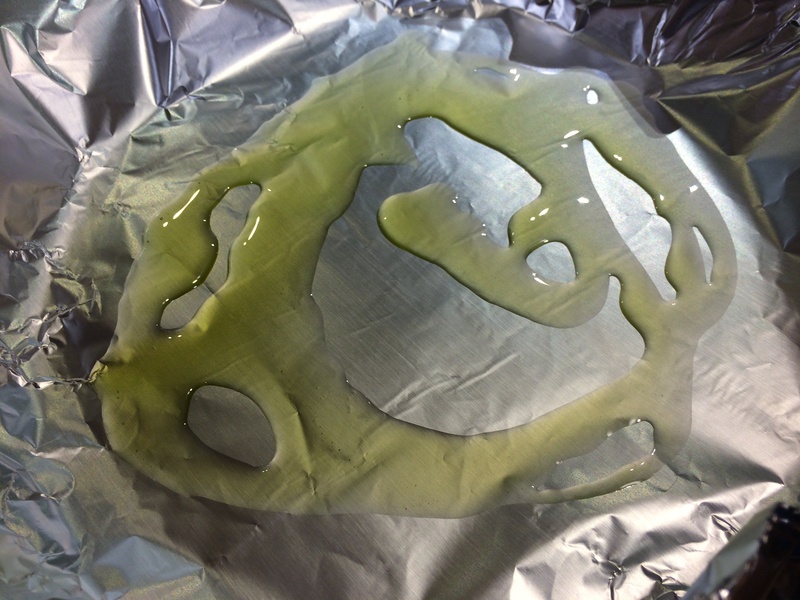 Oil the shaped dough and put into a 9 inch by 5 inch loaf pan, also oiled. 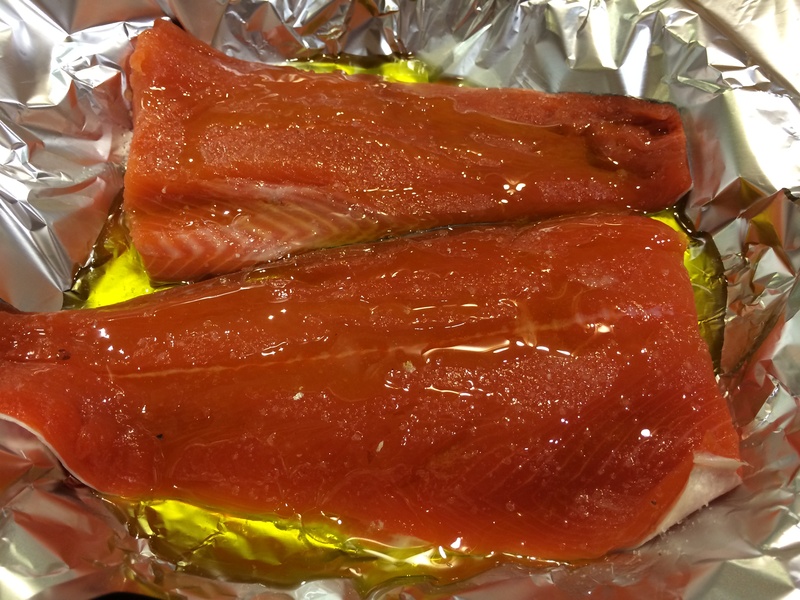 Cover with a plastic wrap and let it rise at room temperature for an hour to an hour and a half more. This is a pretty dense bread, and it is quite a job for the wheat flour gluten to lift up the great heft of the oats and the corn polenta. 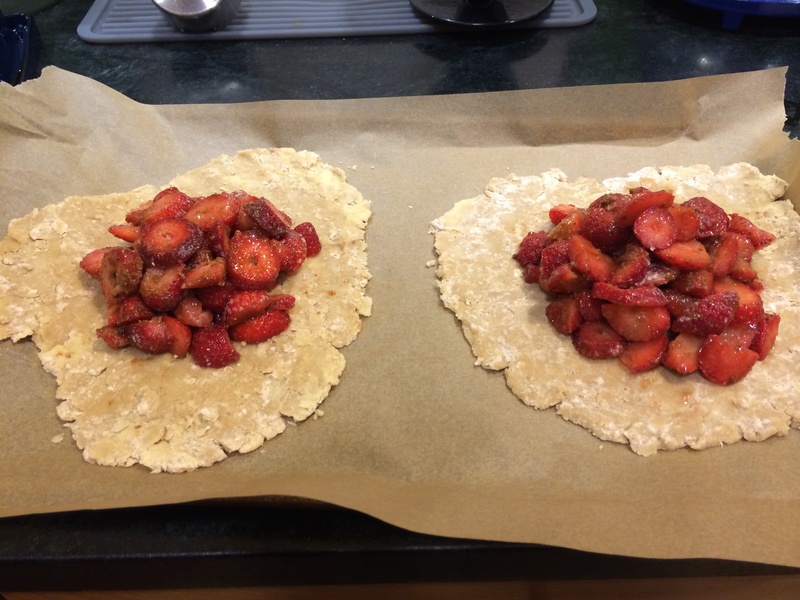 Plus we are using a large percentage of whole wheat flour, the bran in which tends to counteract the lift of gluten. So this bread is not going to win any light-and-airy contests. 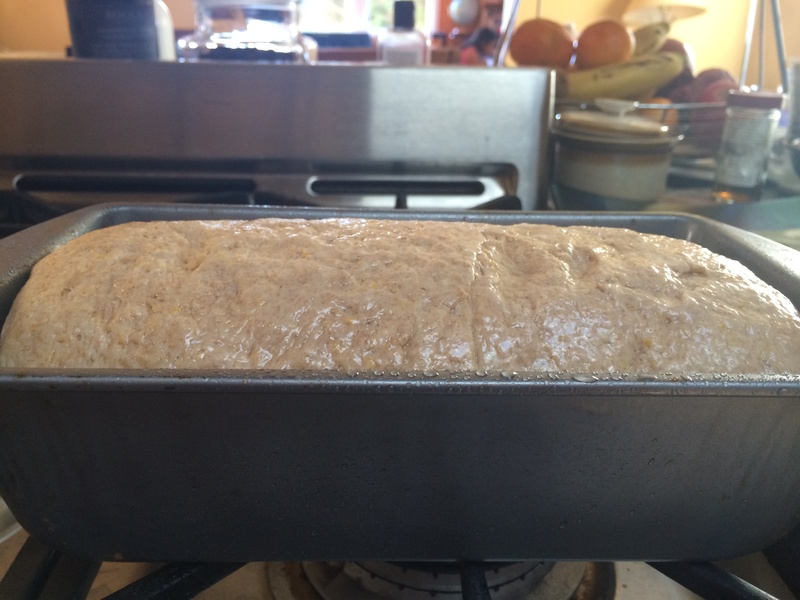 By the time it has peeked over the rim of the loaf pan, it is probably done rising. Bake in a 350 F oven for 55 minutes. An instant-read thermometer inserted into the meat of the loaf should read 200 F. Take it out of the oven and let it cool on a rack for an hour before slicing into it. Thank you, unknown denizen of the Internet. We spent labor day in a rented cabin in the Tahoe region. We had a state of the art kitchen at our disposal, a warm cozy evening for dining in, a few vegetables in the fridge, but no spices whatsoever. 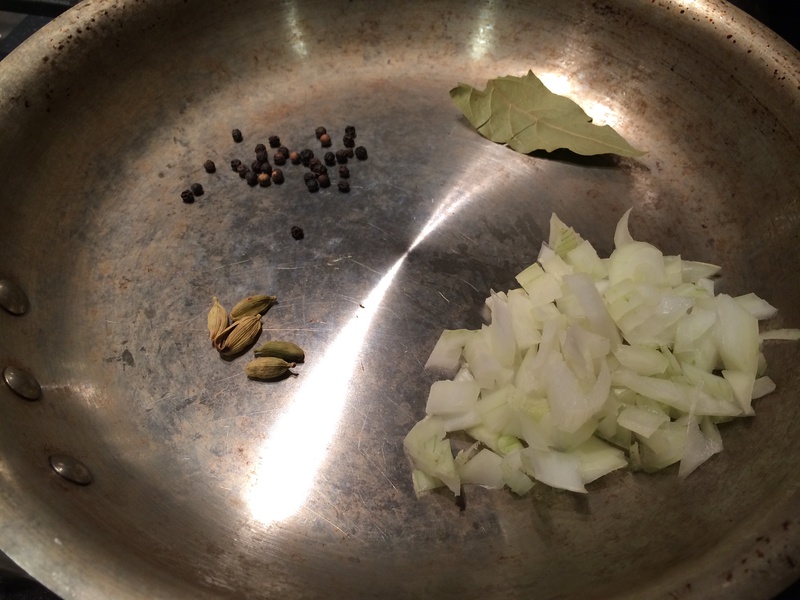 What’s an Indian cook to do? 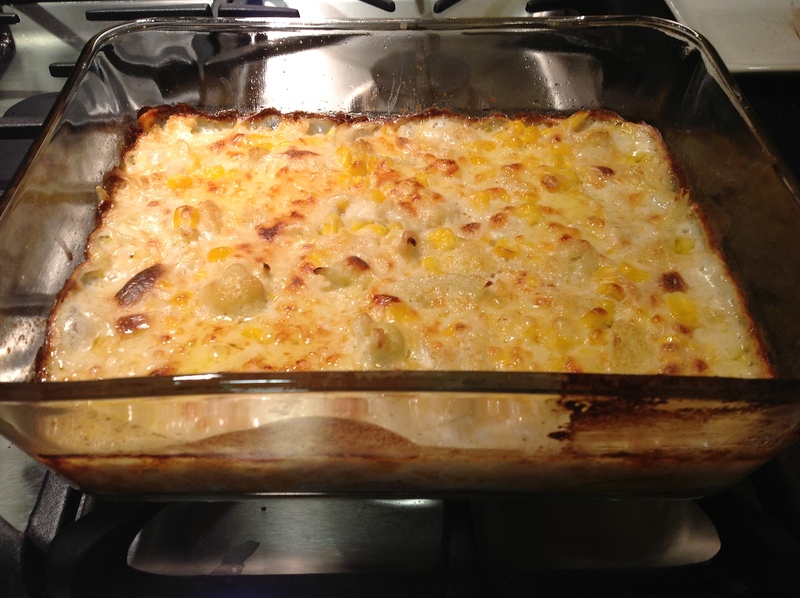 I love gratins — the creamy cheesy crusty casseroles. I was first introduced to gratins in an strange fashion — a pure vegetarian Gujarati restaurant in Bombay had a ‘Vegetable Au Gratin’ on the menu and it was delicious. 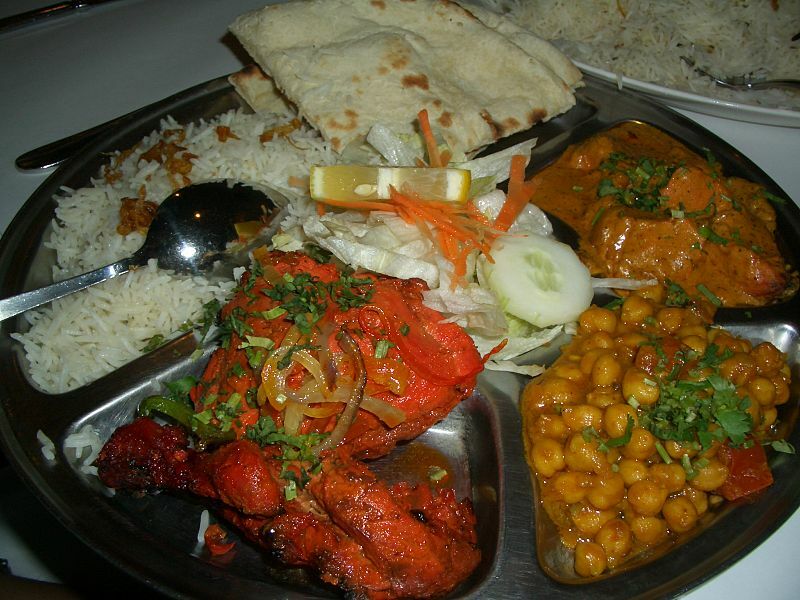 Restaurants in India have this strange quirk where the advertised cuisine hardly matters — a South Indian dosa restaurant will have an entire Indian Chinese menu, and throw in a club sandwich as well. They don’t seem to believe in specialization of cuisine. Sort of like the proprietor here at The Odd Pantry you say? Hmm. 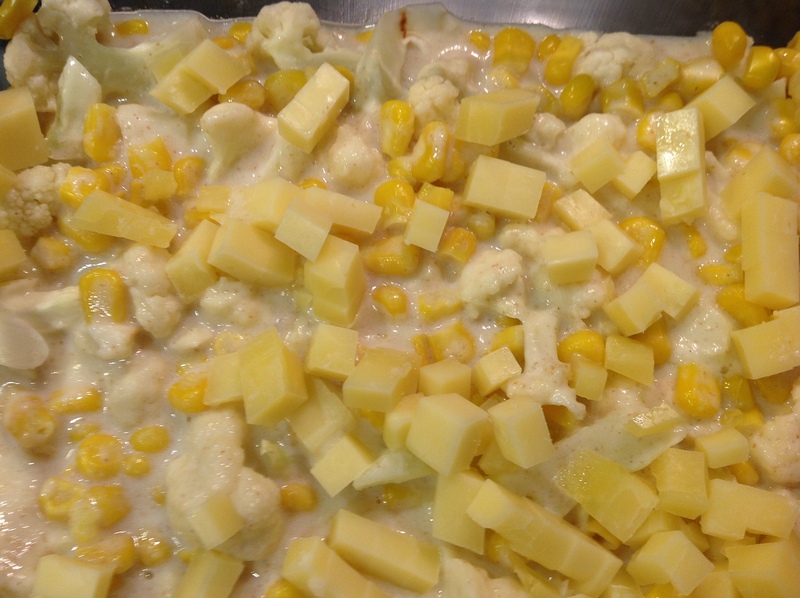 At any rate, this is a pure vegetarian gratin, and it is built in layers of potato, cauliflower and corn…all vegetables with distinct flavors that nevertheless that have a certain savoriness that unites them. 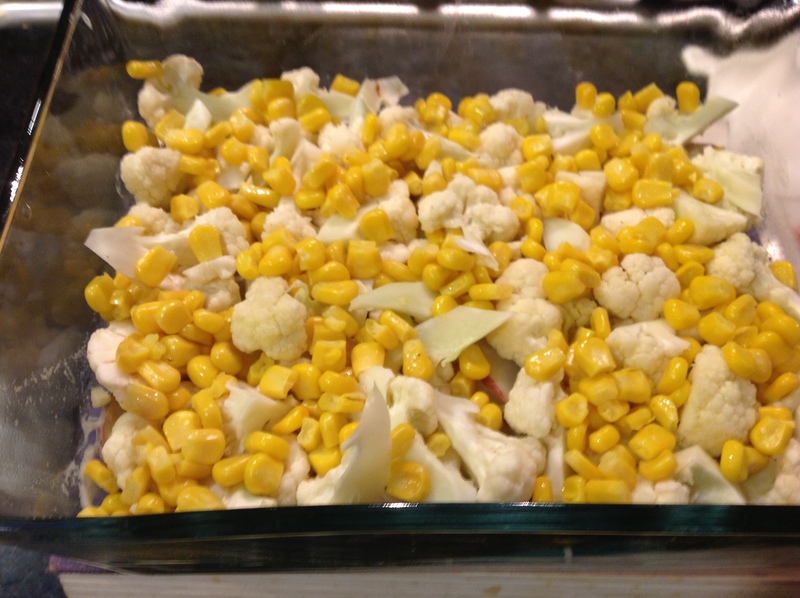 In this dish I precook all the vegetables to minimize and equalize the gratin baking time. The other principle I follow is to salt each layer on its own. First, the potatoes. 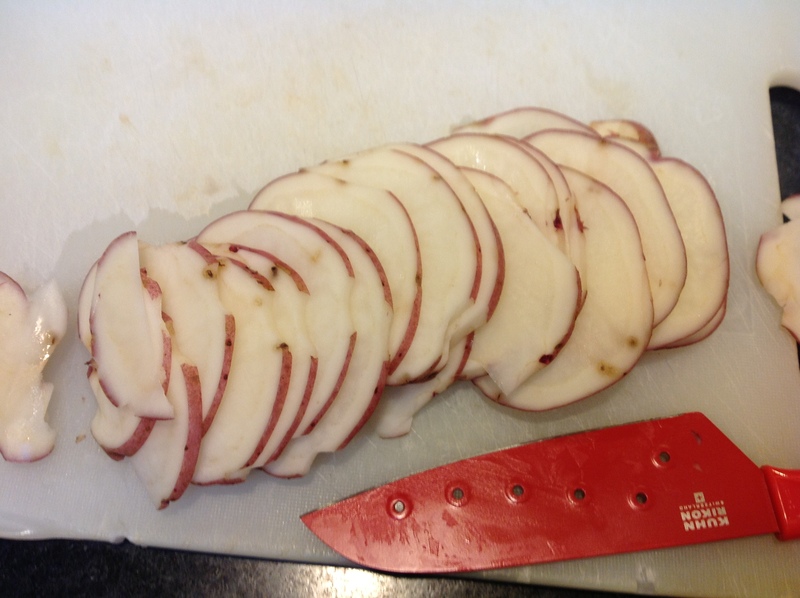 Slice the potato as thin as you can get them (eighth of an inch). 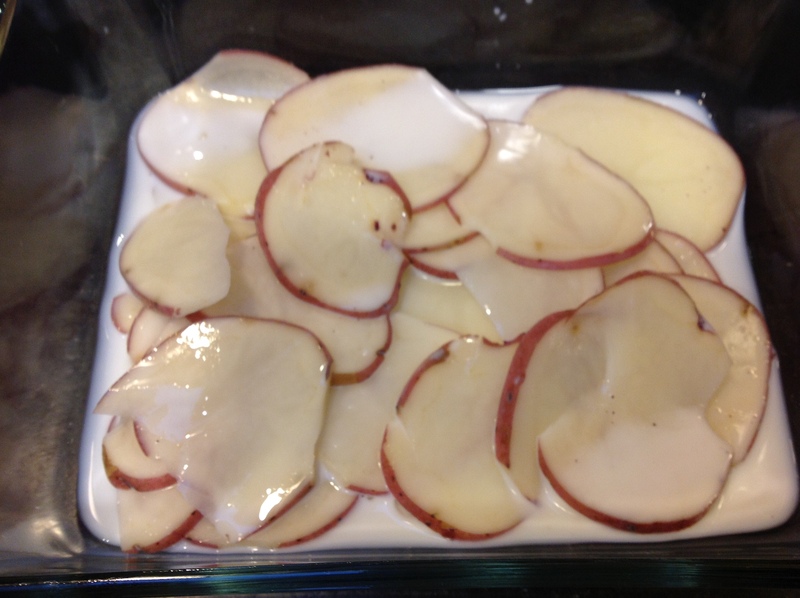 Put them in a pyrex container, add salt enough for the potatoes, and submerge them in half a cup milk. 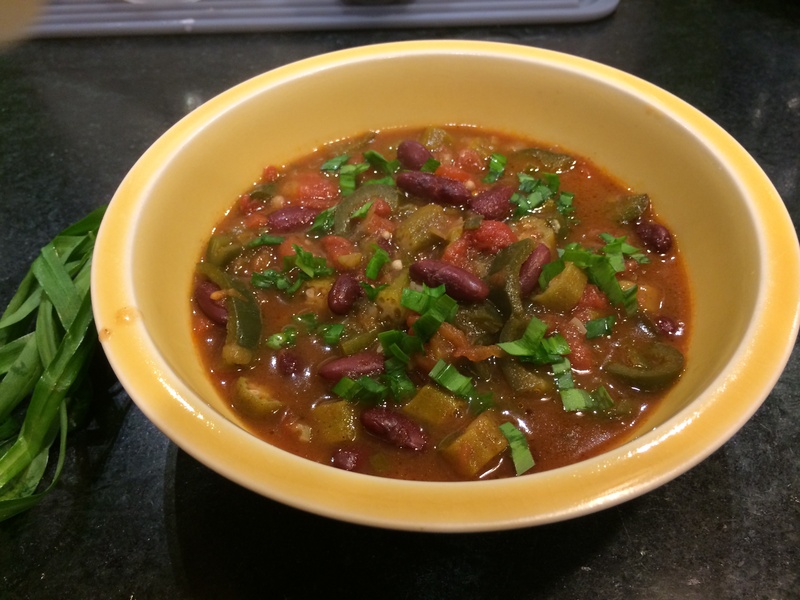 Microwave for 2 – 3 minutes and then set aside. Next the cauliflower. 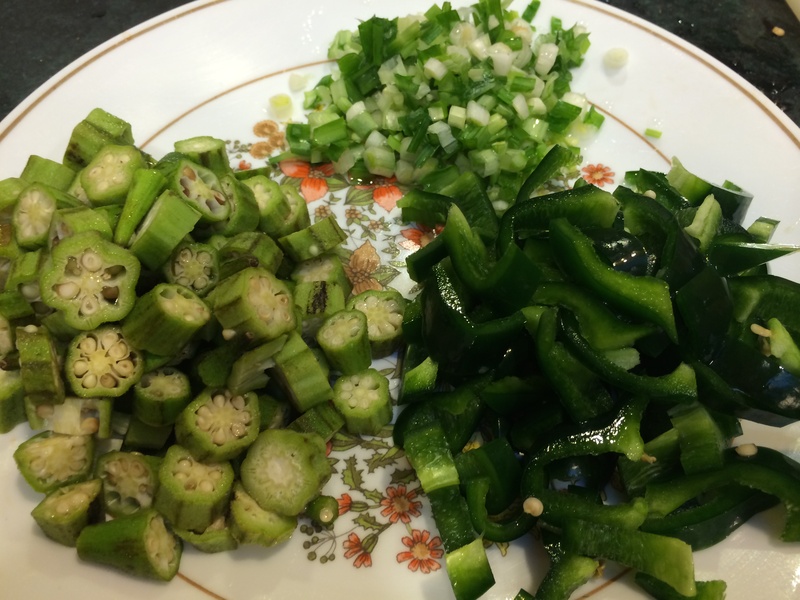 Slice the florets into quarter inch thick slices, put them in a bowl, add some salt, and once again, microwave for 2 – 3 minutes and set aside. Next the corn. 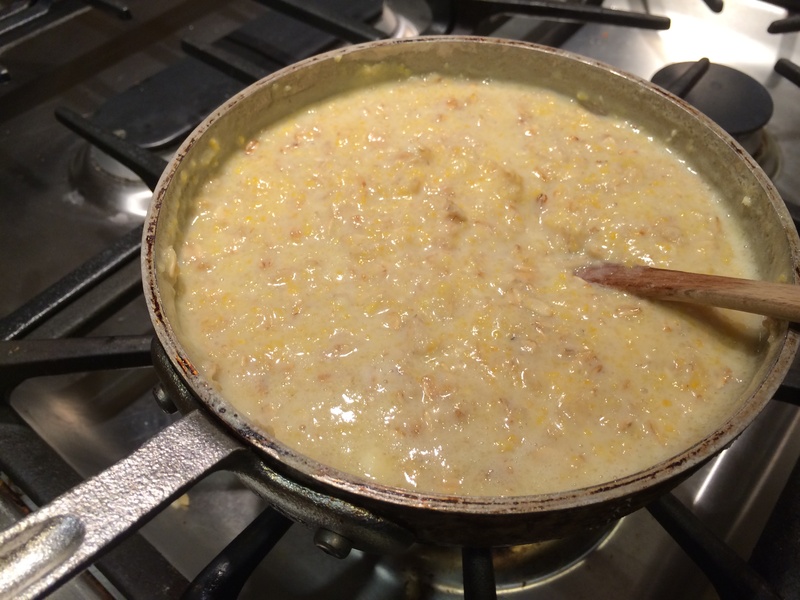 Same routine — put in a bowl, add salt enough for the corn, and microwave. With the frozen corn all we are trying to do is thaw them. Vegetables are ready. 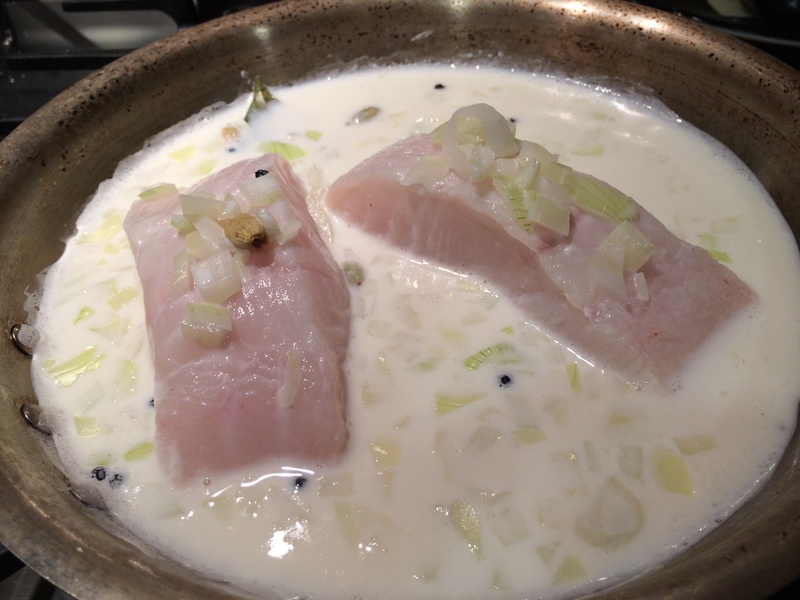 Let’s make the bechamel sauce. Heat the butter in a small pot. When it melts, add the flour and stir, stir, stir on gentle heat. It will foam and bubble and perhaps turn a shade darker. Now put in the milk. Stir with your wooden spoon for dear life as you slowly pour the milk in. You may need to resort to a whisk, the idea is we are trying to not have any lumps. Keep the heat gentle. You can also pour in any extra milk from the potato cooking bowl. 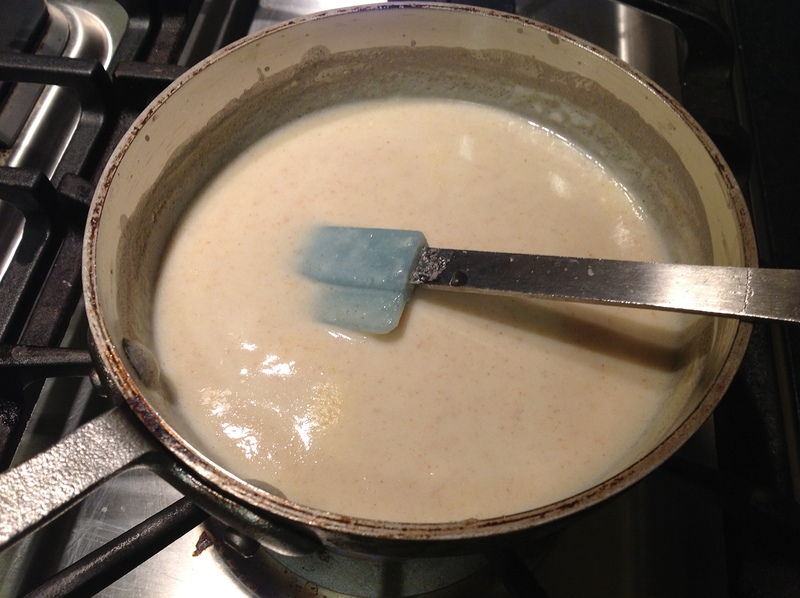 Once all the milk has gone in, and the mixture is smooth, you can up the heat and bring to a boil. Add salt enough for this sauce. Once it comes to a boil, turn it off after a minute. We are ready to compose the layers. 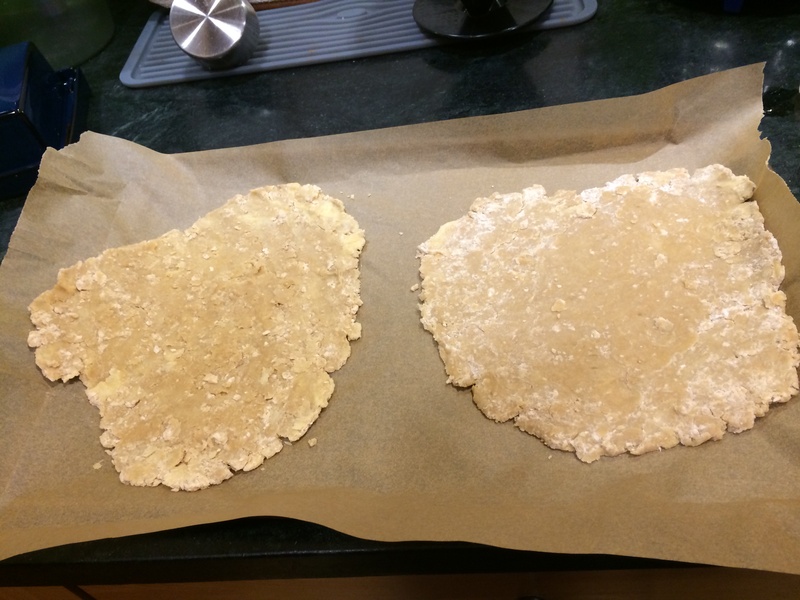 In a flat baking dish, first layer in the potato slices, trying to keep even thickness. 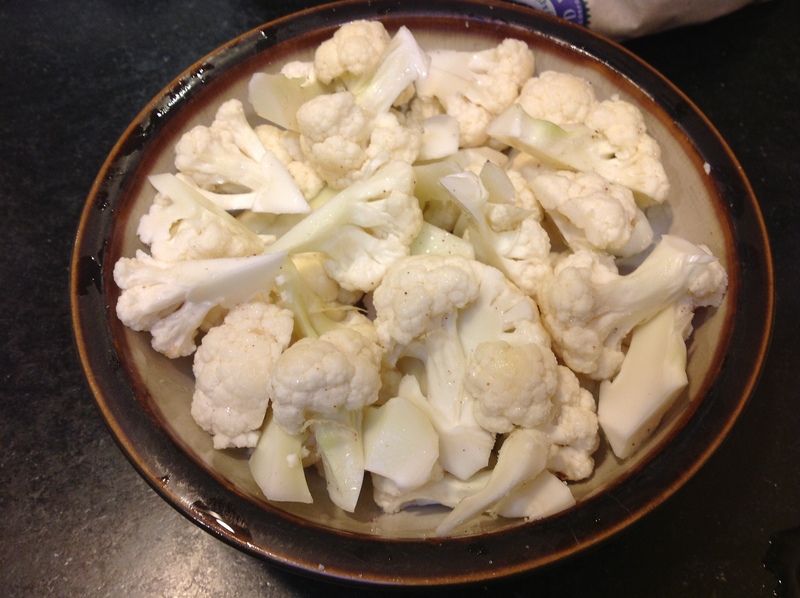 Next put on the cauliflower florets in a layer. Next the corn. 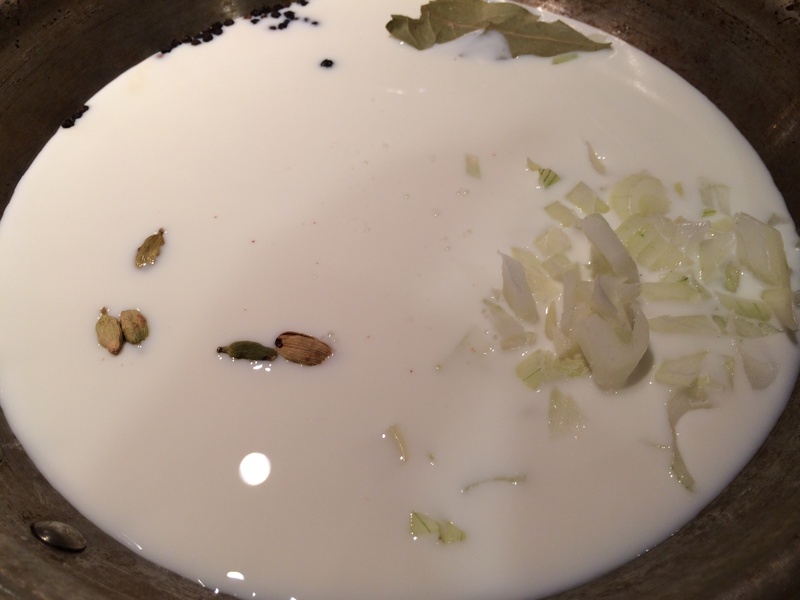 Now pour the bechamel sauce all over the vegetables, pushing and prying with a spatula to get it everywhere. 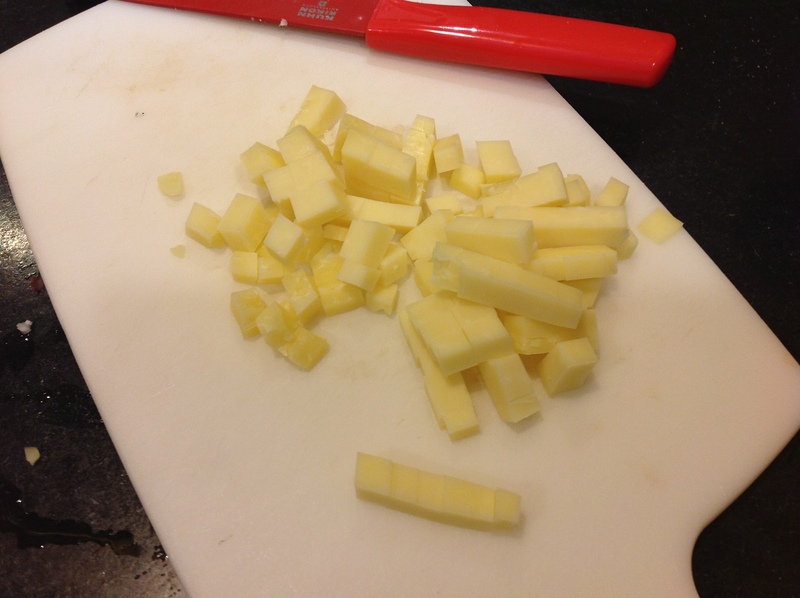 Cut the cheese up into tiny cubes. Cover the top of the casserole with cheese. 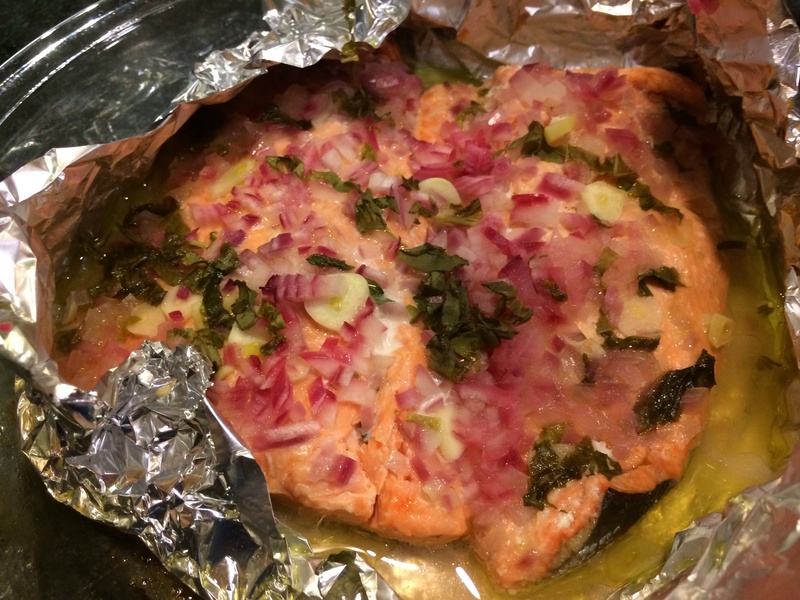 Cover with foil and bake for 45 minutes at 425 F. In the last 10 minutes, take the foil off to get it to brown. 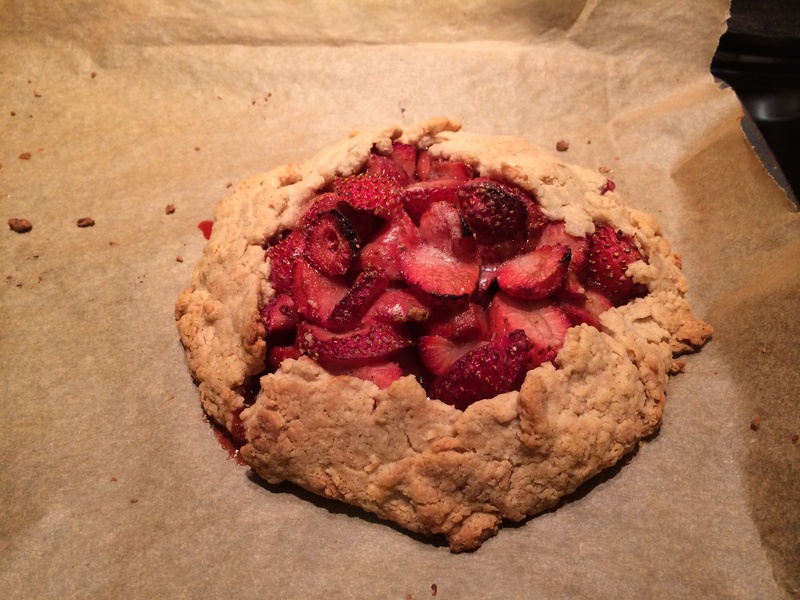 If you want more of a brown crust, stick it under the broiler for 5 extra minutes. 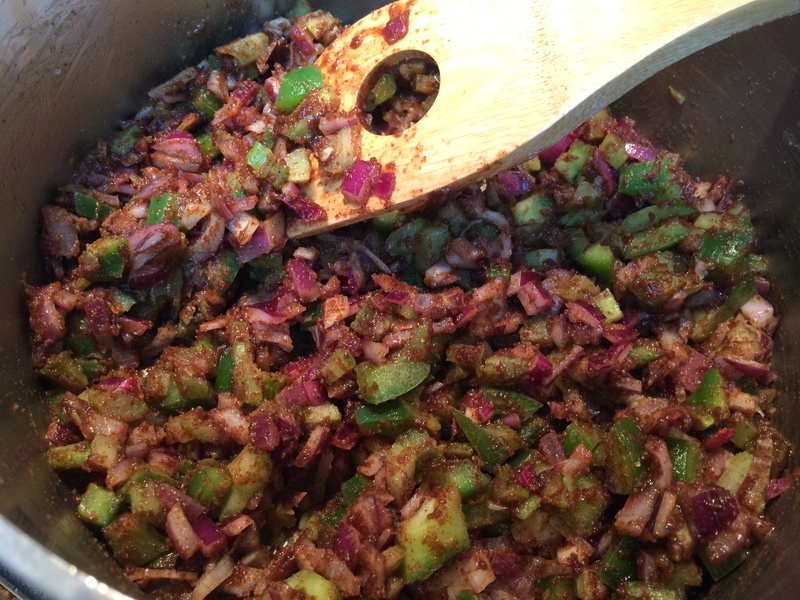 Here are some other ideas for other vegetables to add to the mix: peas, leeks, roasted zucchini.